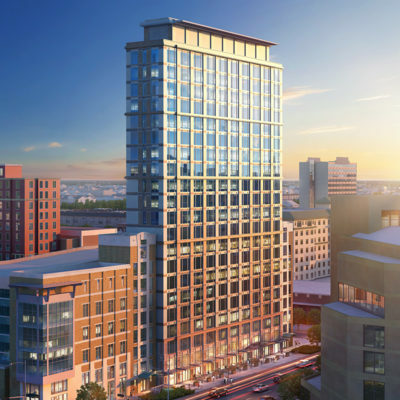 Hausmann has been tapped to construct this 20-story condominium building in Downtown Lincoln, Nebraska. 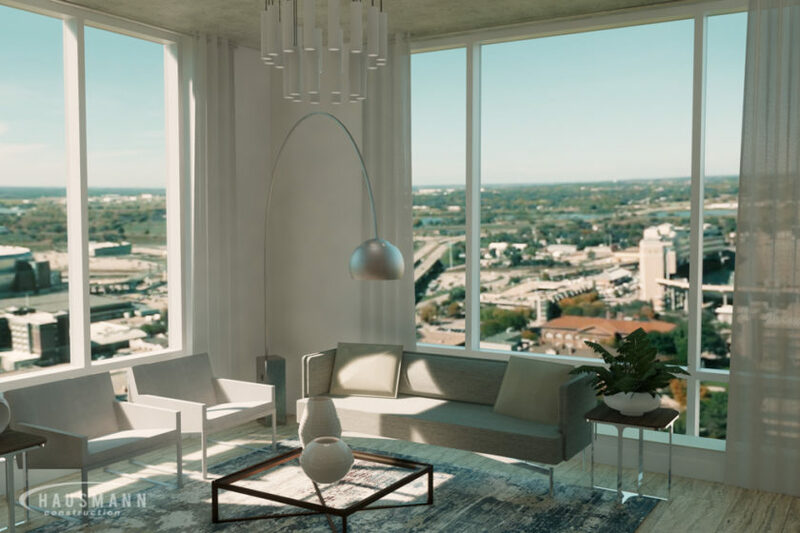 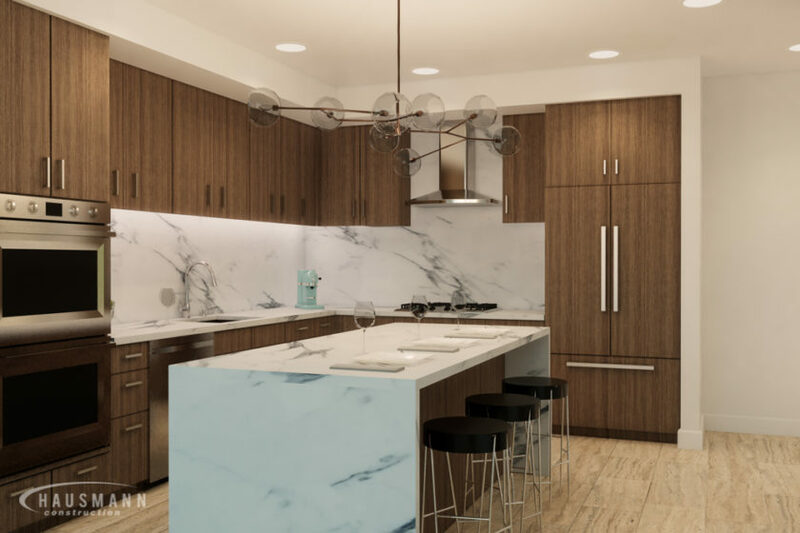 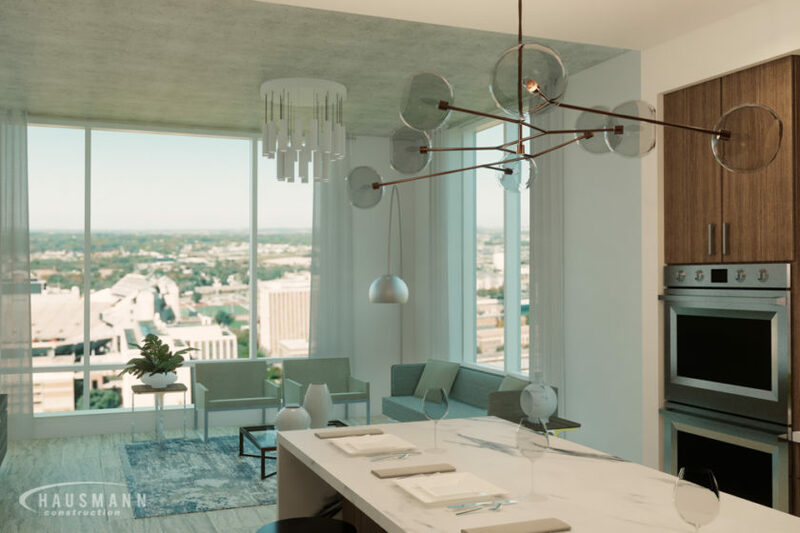 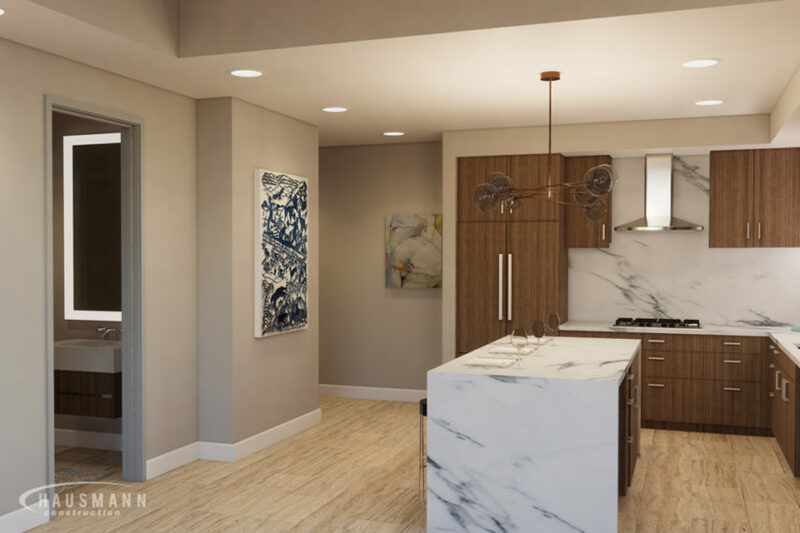 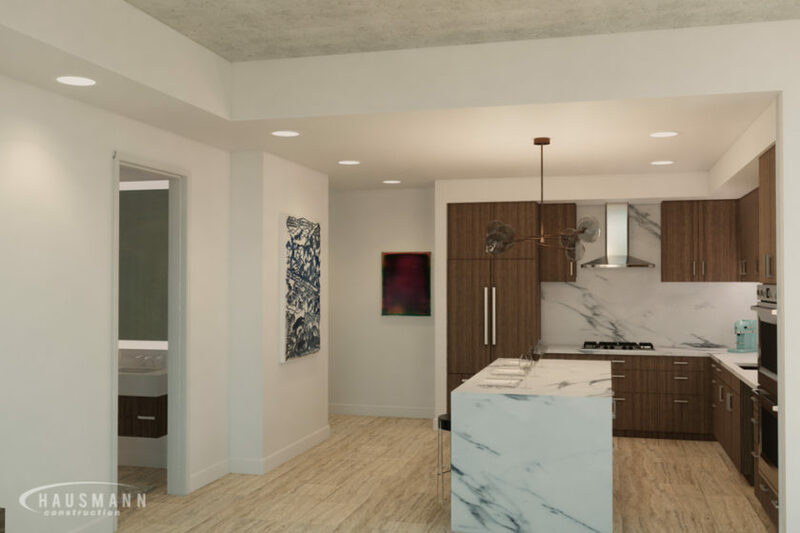 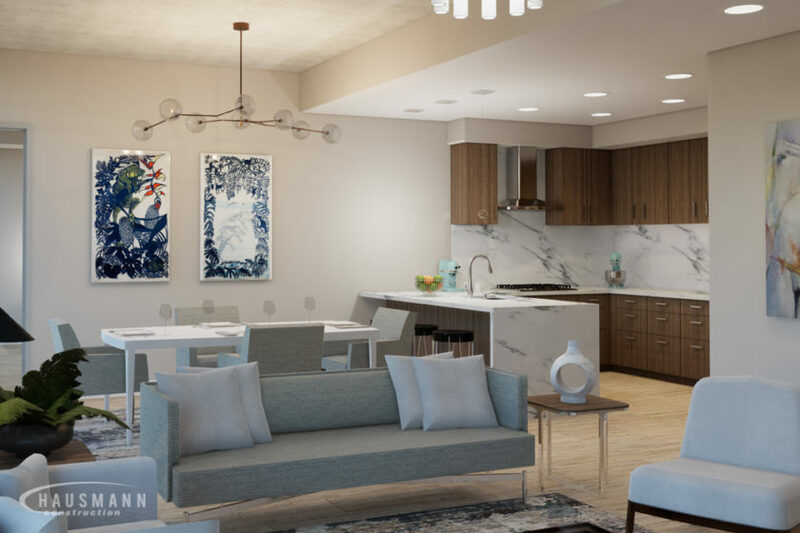 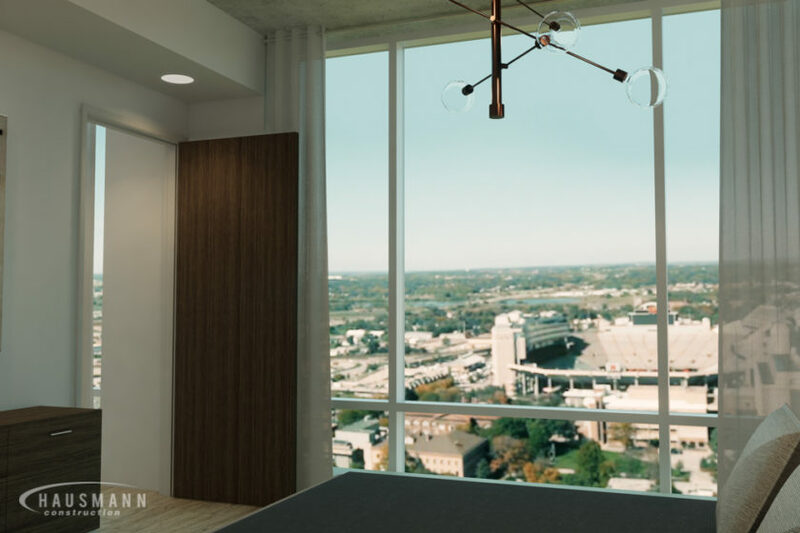 Located at 12th & Q Streets, Lied Place Residence will be a $30 million redevelopment project and at completion, Lincoln’s second tallest building next to the Capitol. 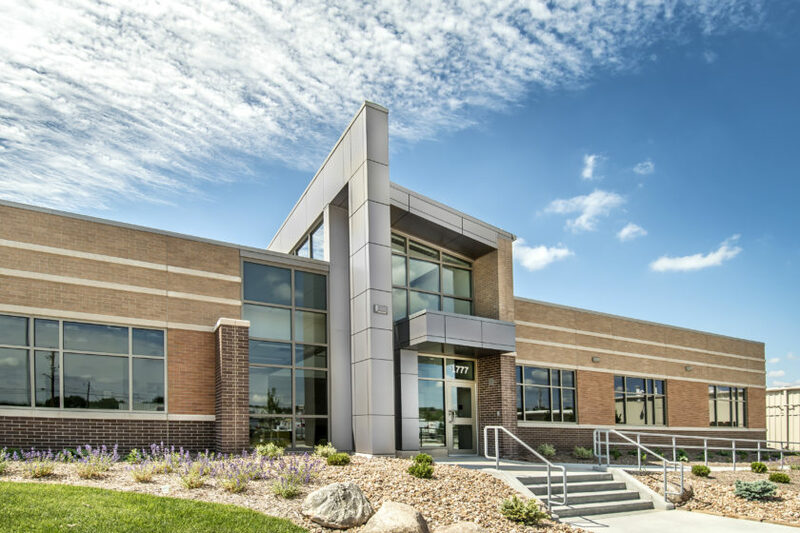 This project features an 80,000 square foot multi-tenant building. 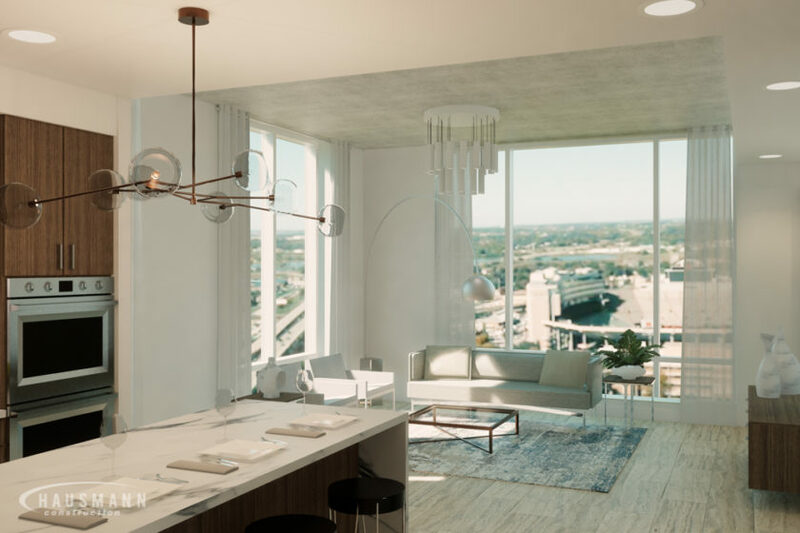 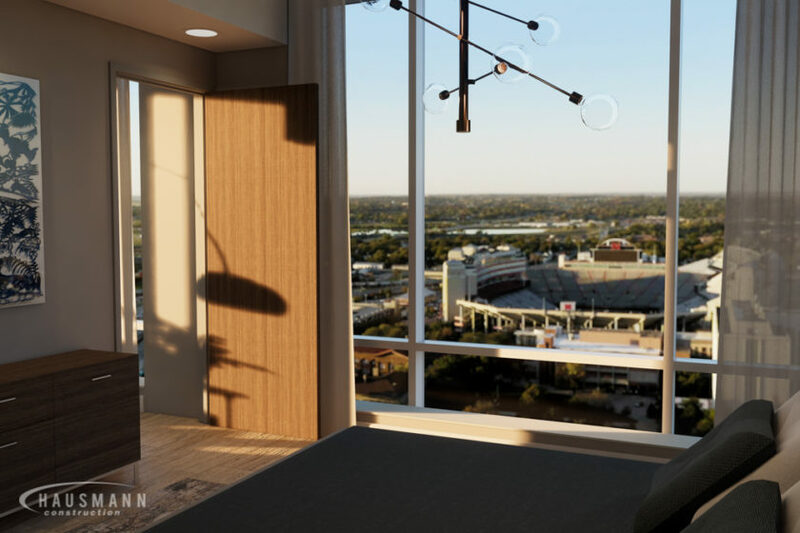 Personal balconies, collaboration space, kitchen and dining areas are built to LEED Silver standards. 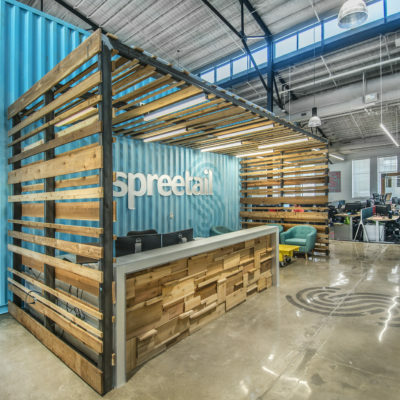 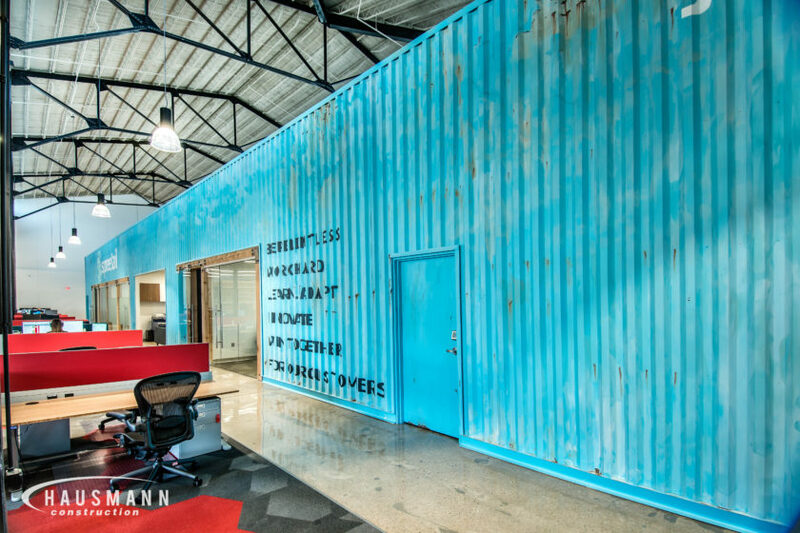 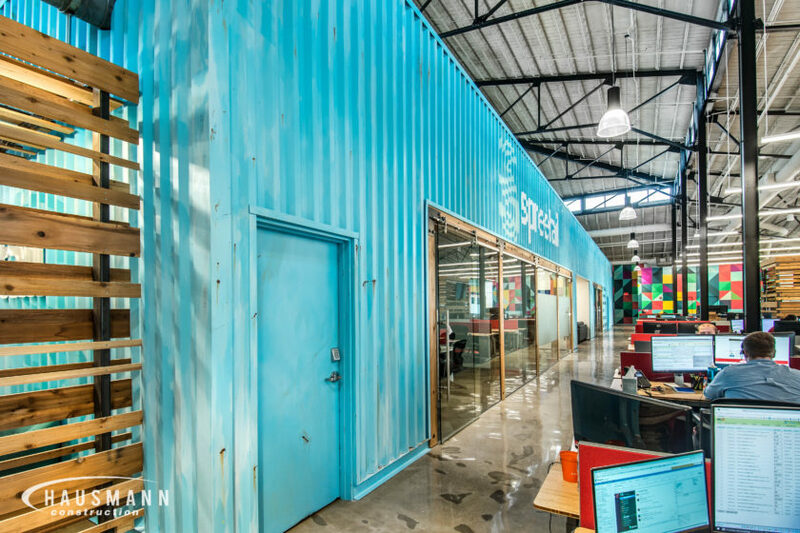 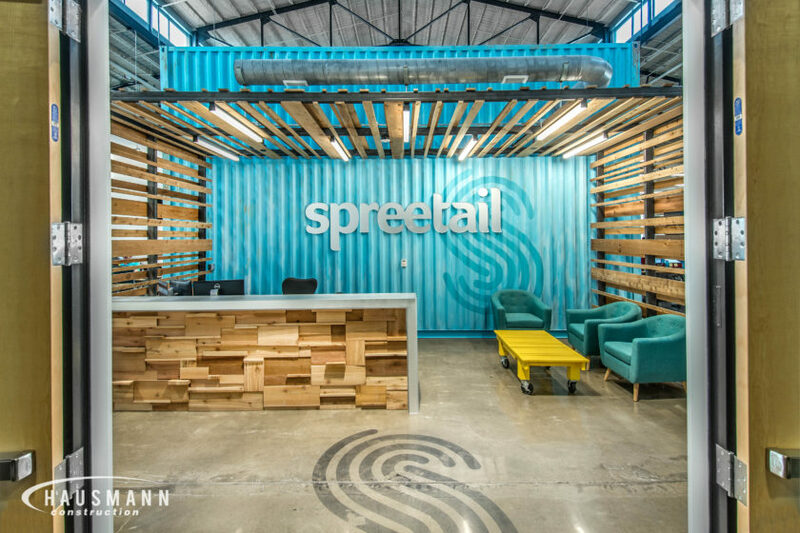 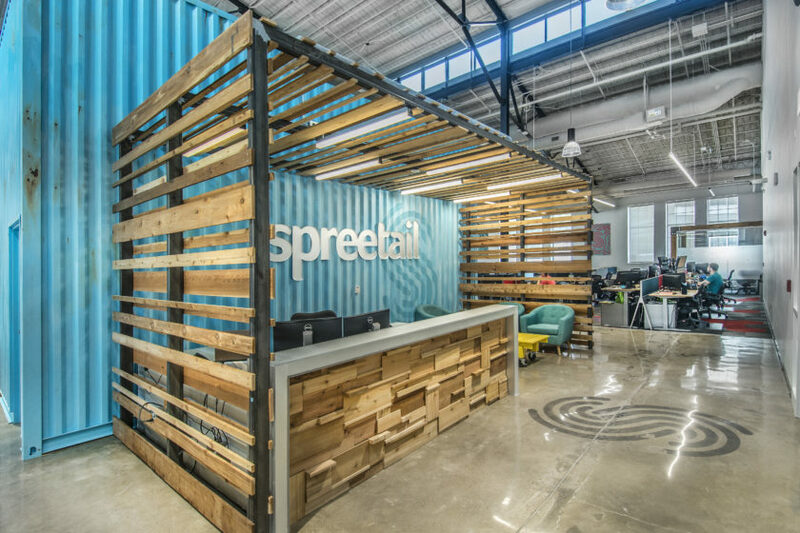 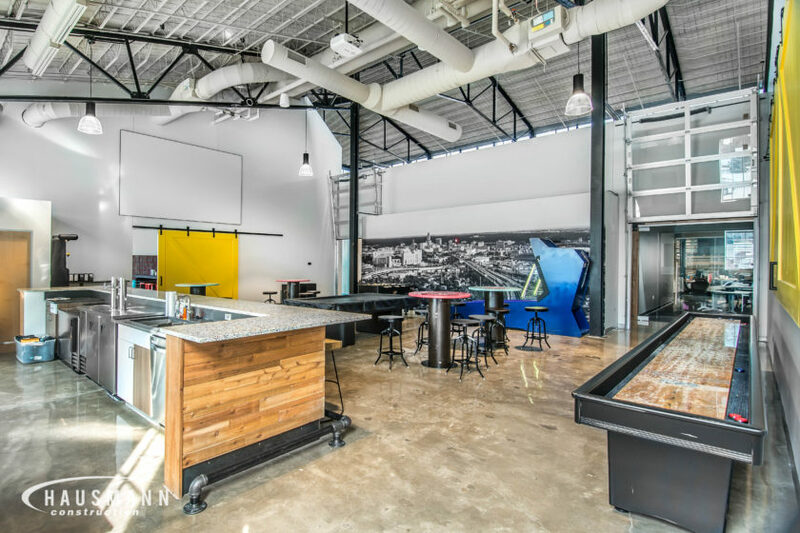 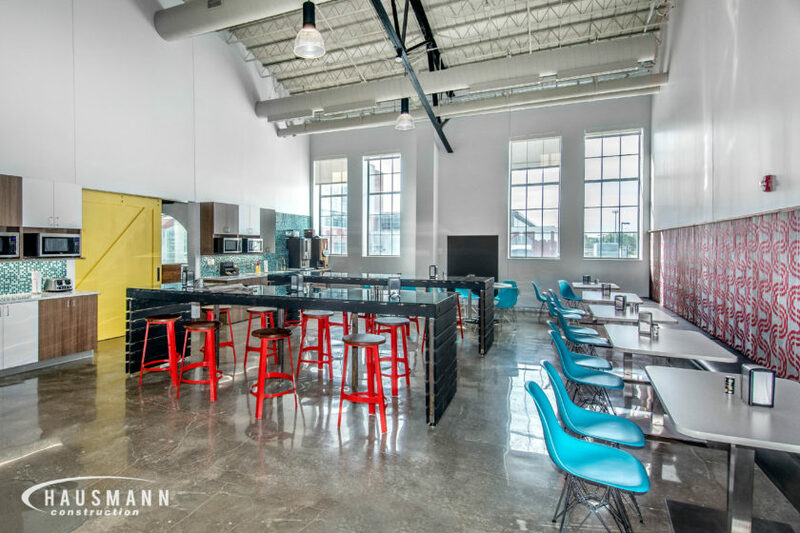 The Spreetail project was an interior tenant finish for a newly re-branded e-commerce company, formerly VM Innovations. 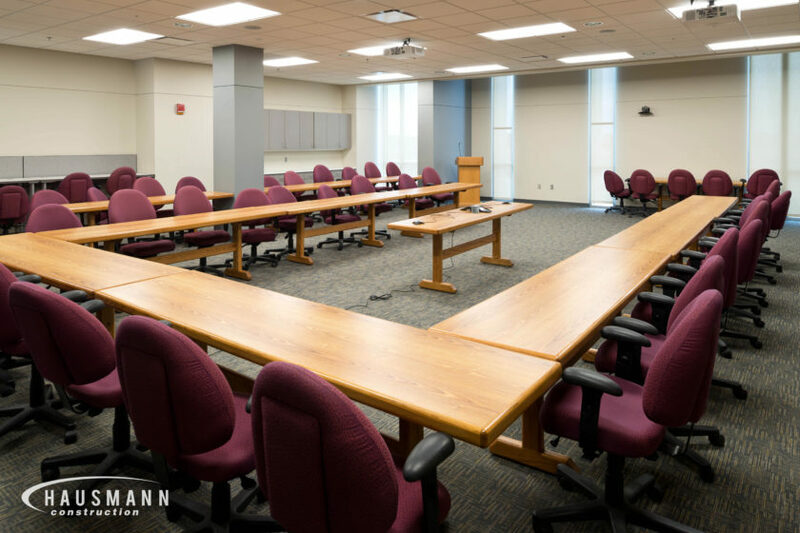 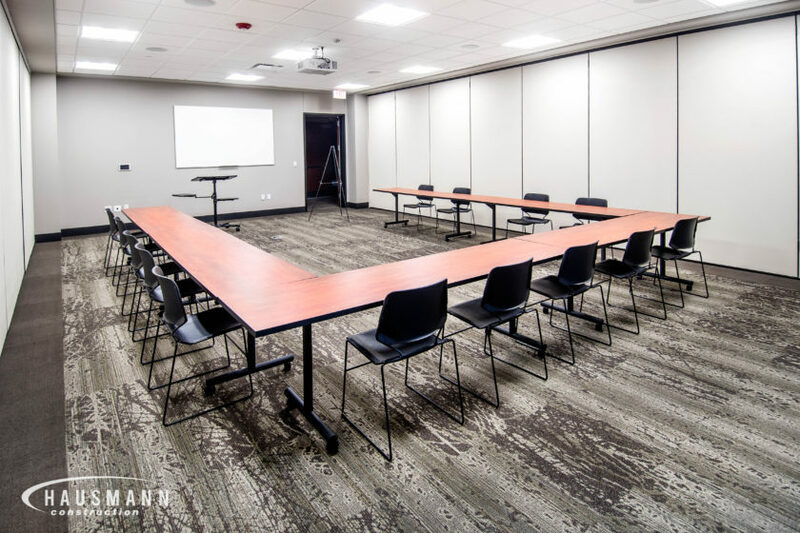 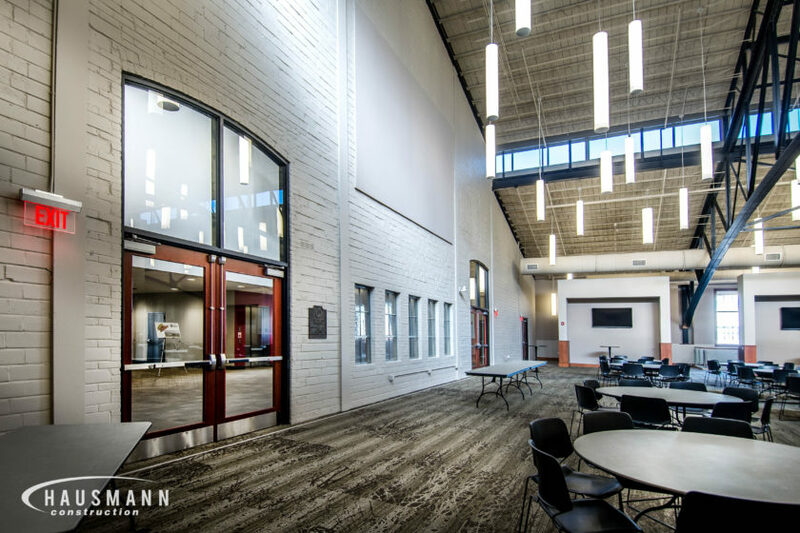 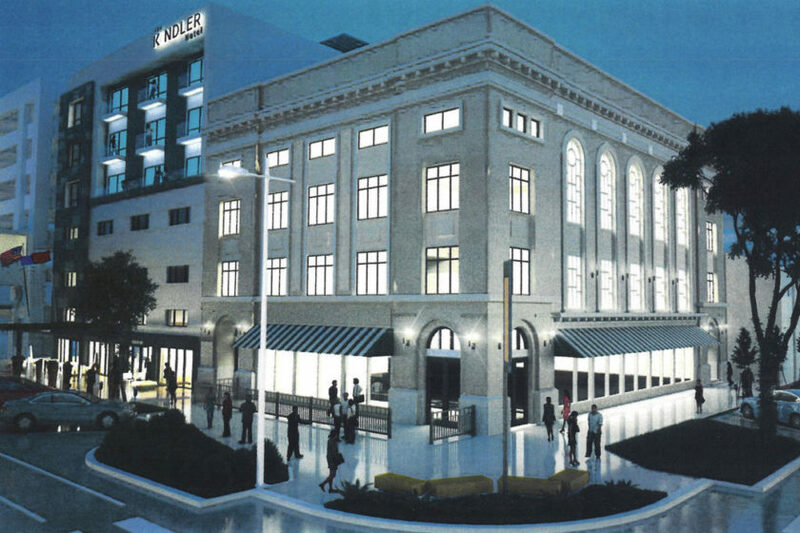 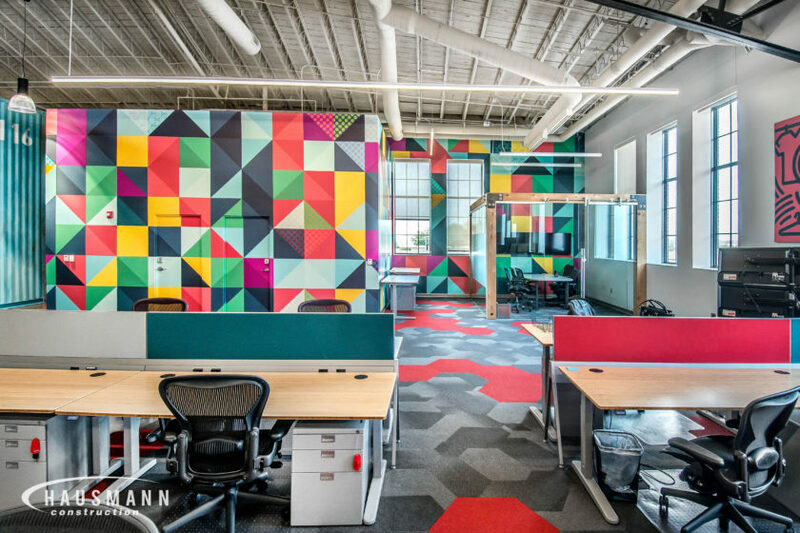 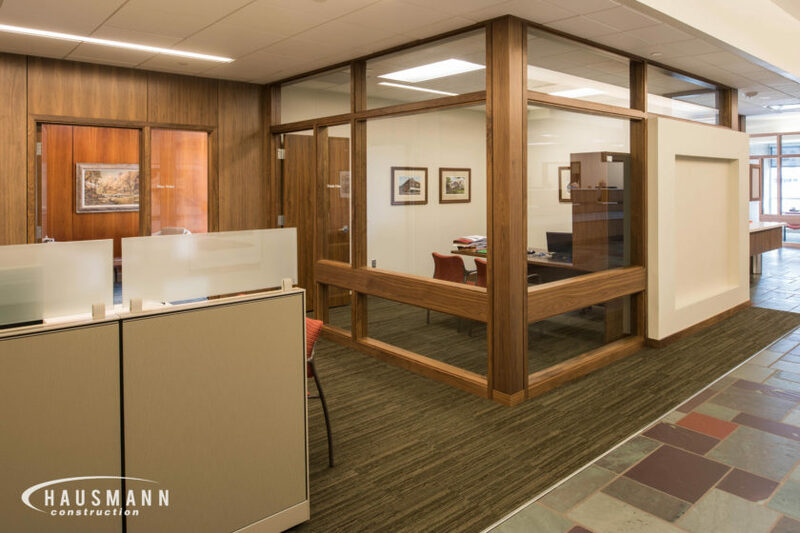 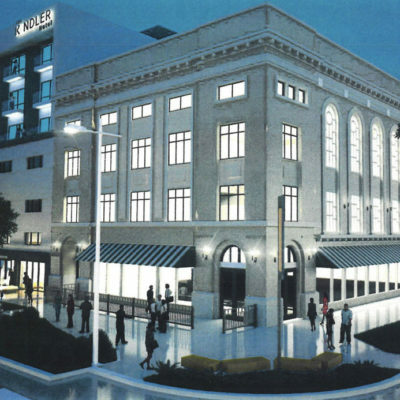 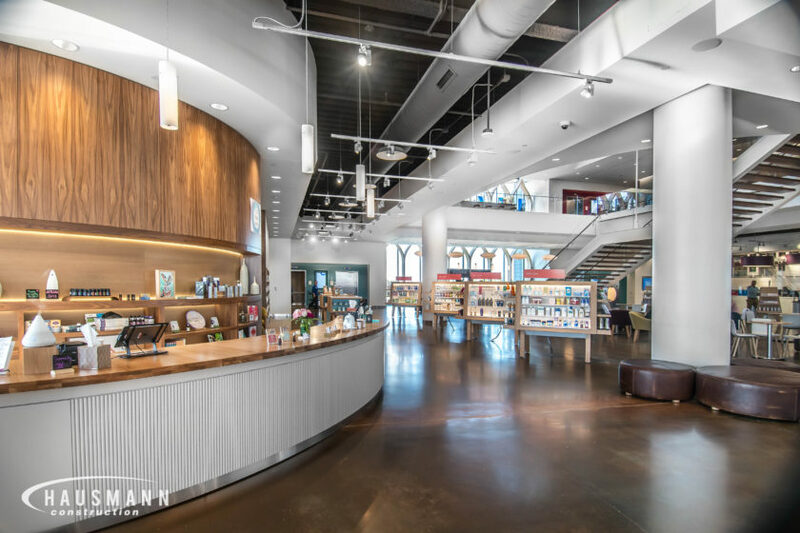 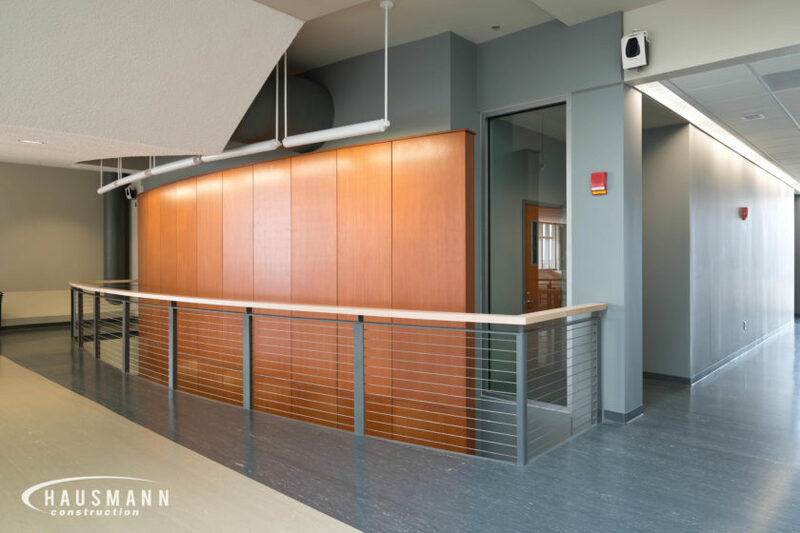 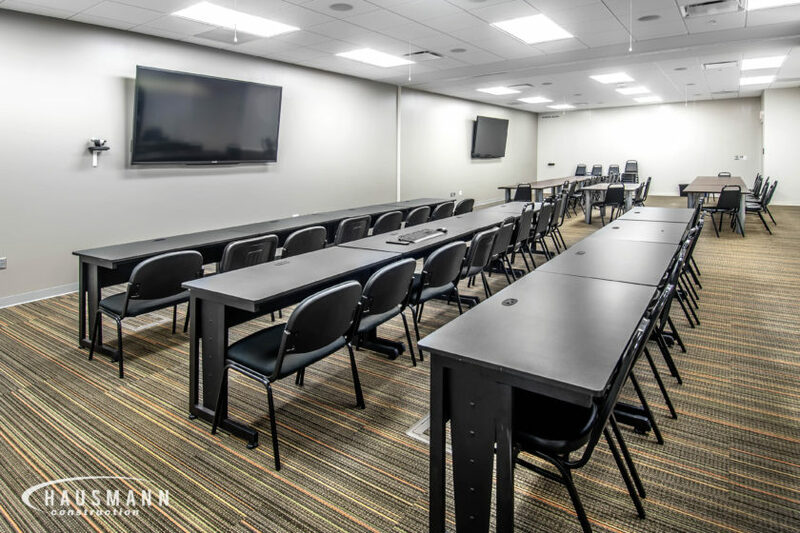 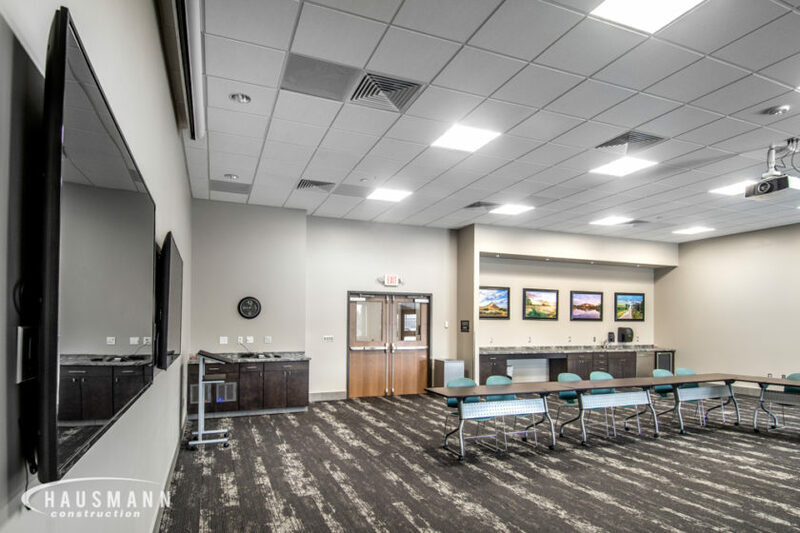 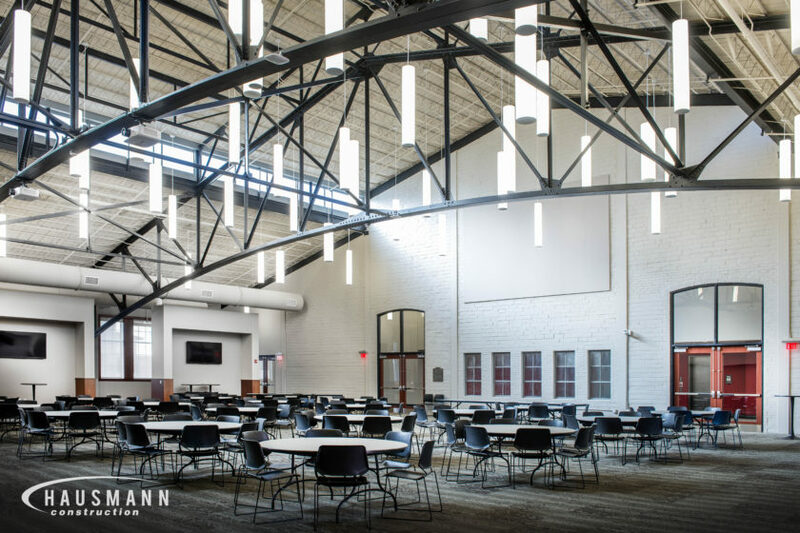 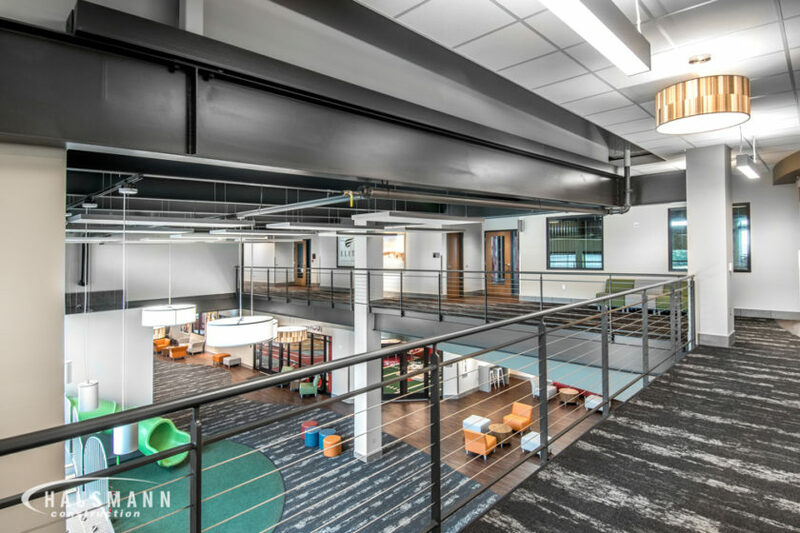 The project consisted of a 16,000 square foot space on the second floor of the historic 4H Building on Innovation Campus in Lincoln, Nebraska. 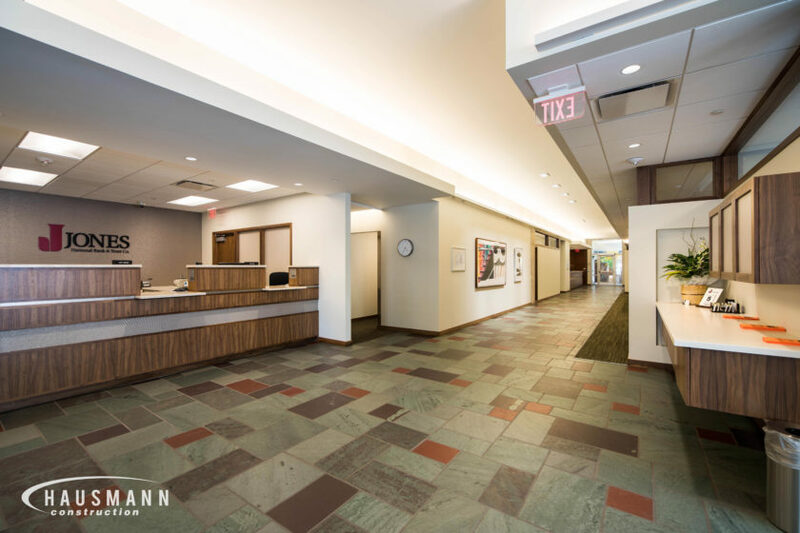 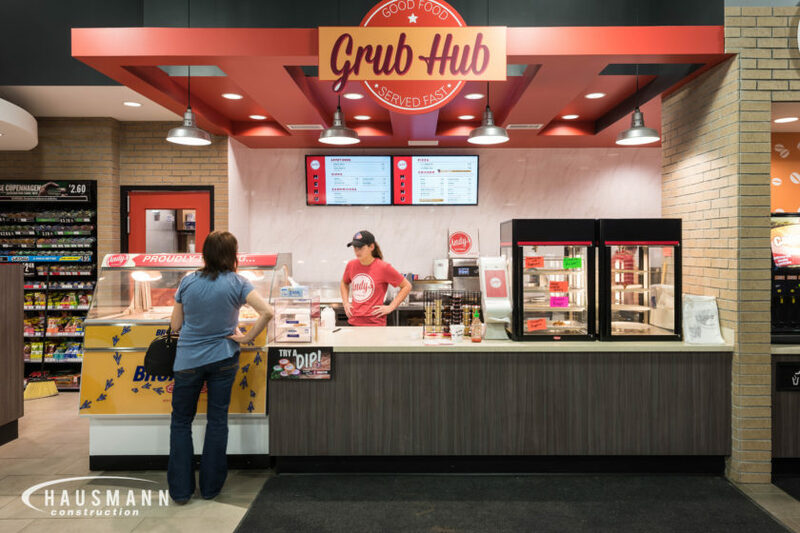 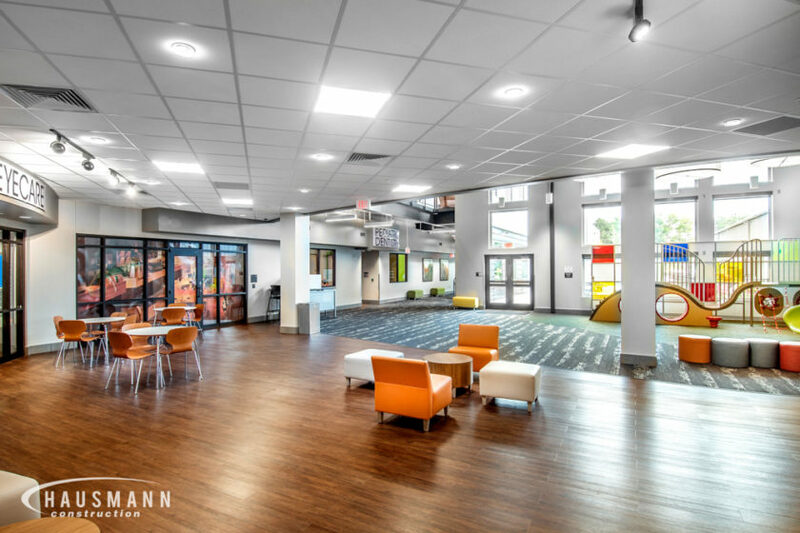 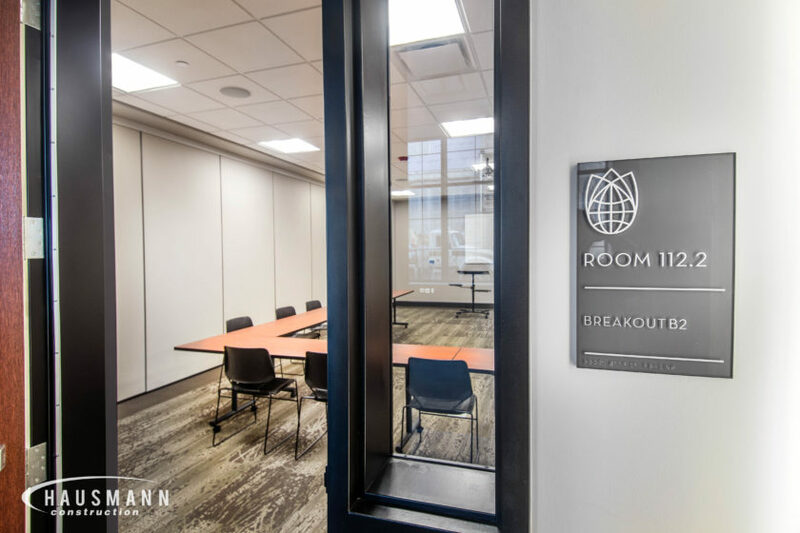 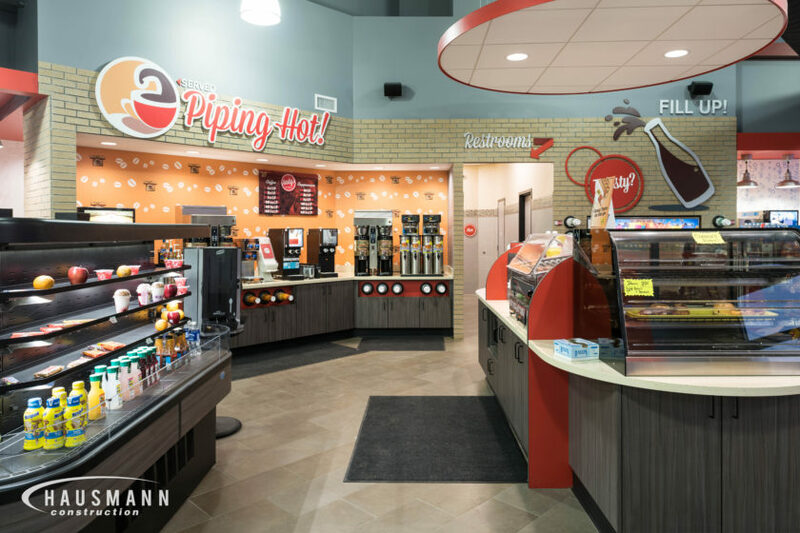 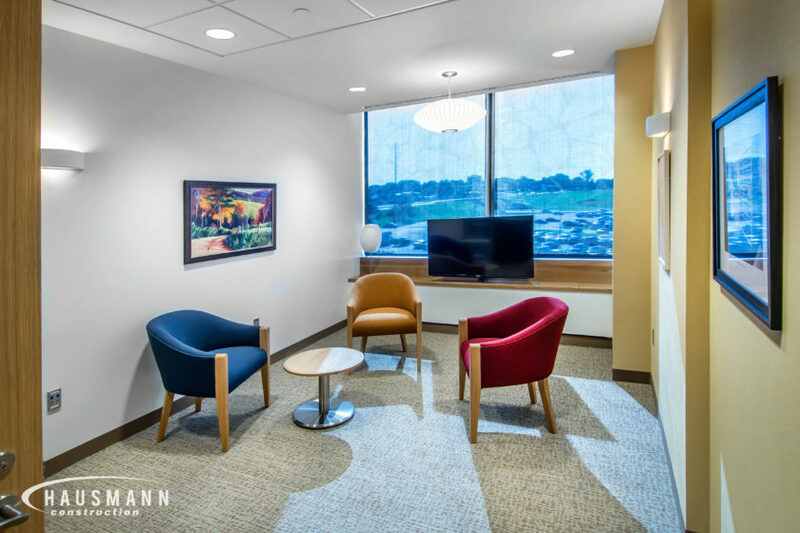 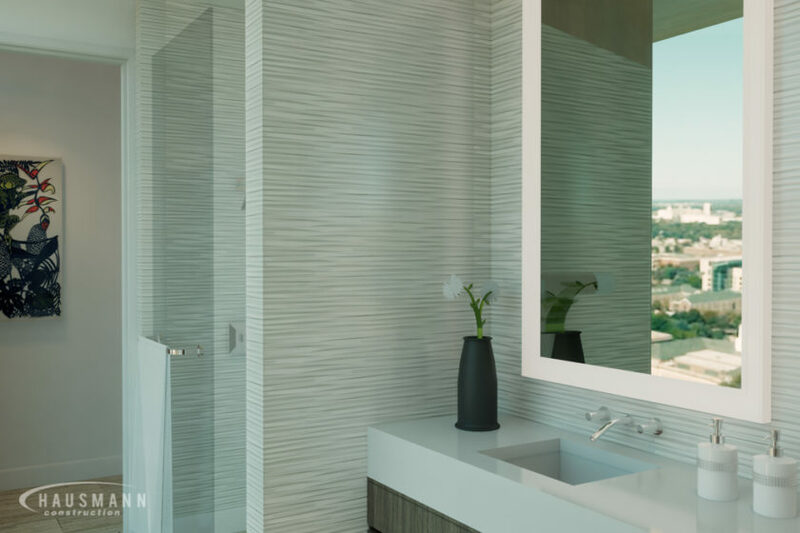 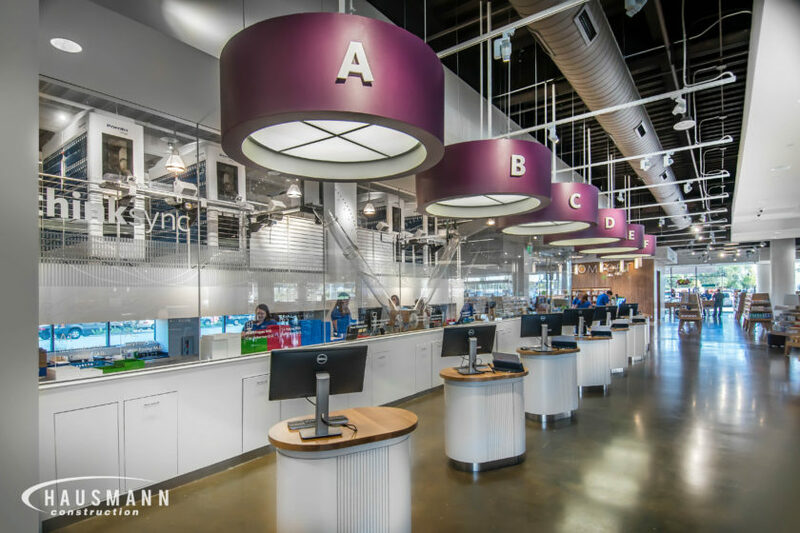 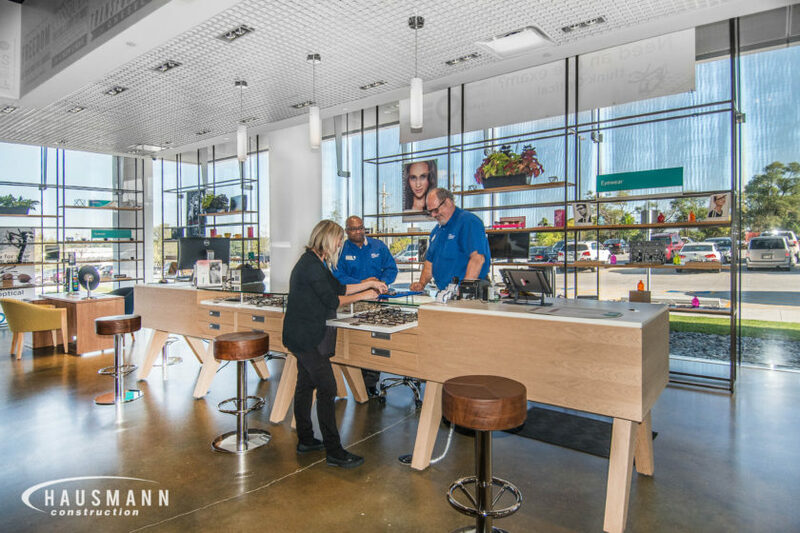 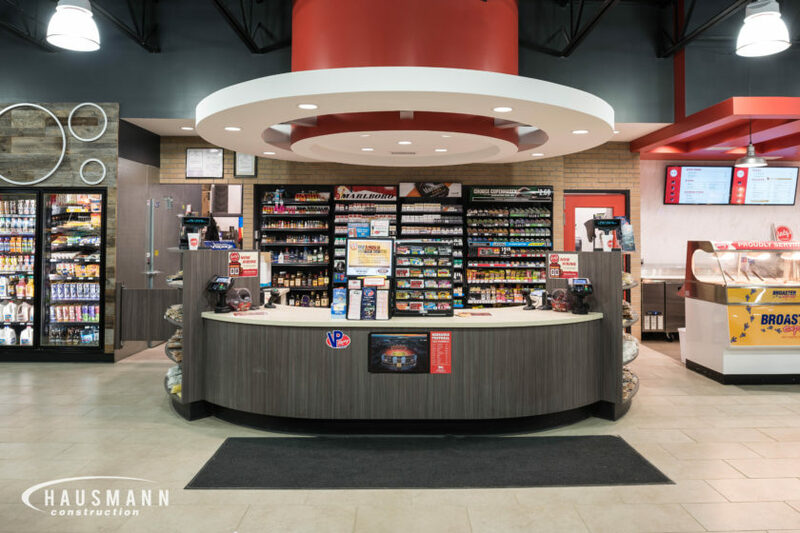 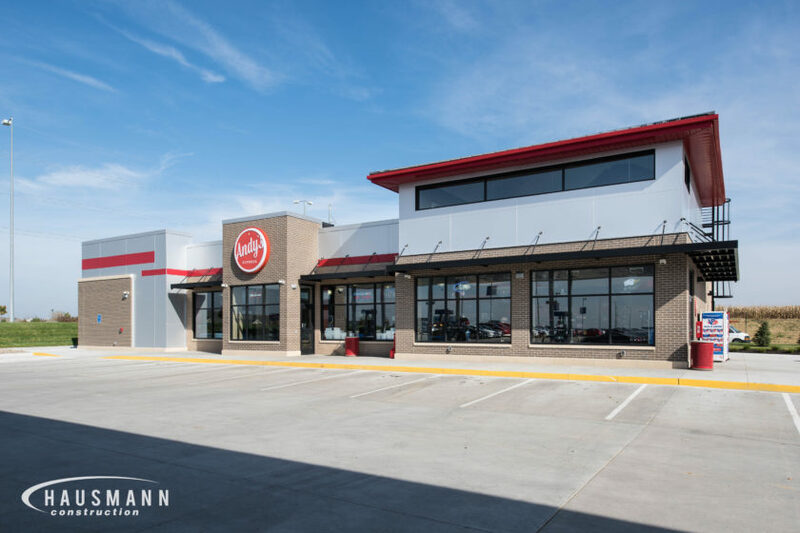 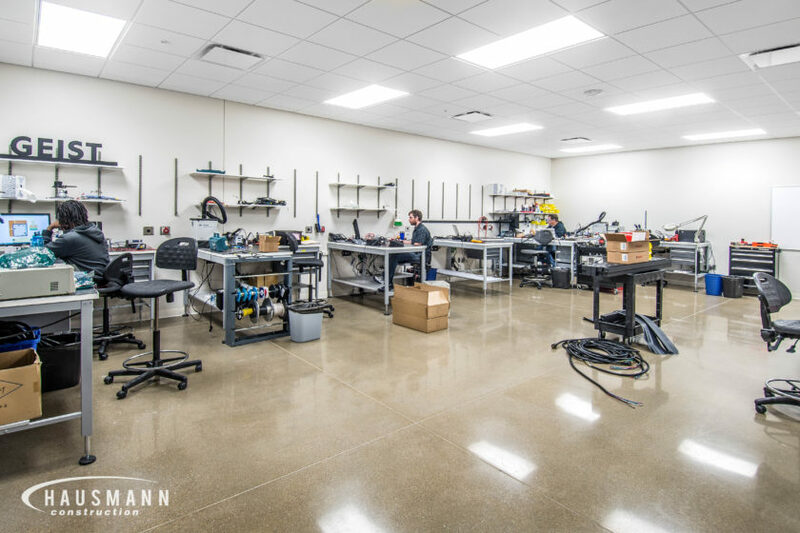 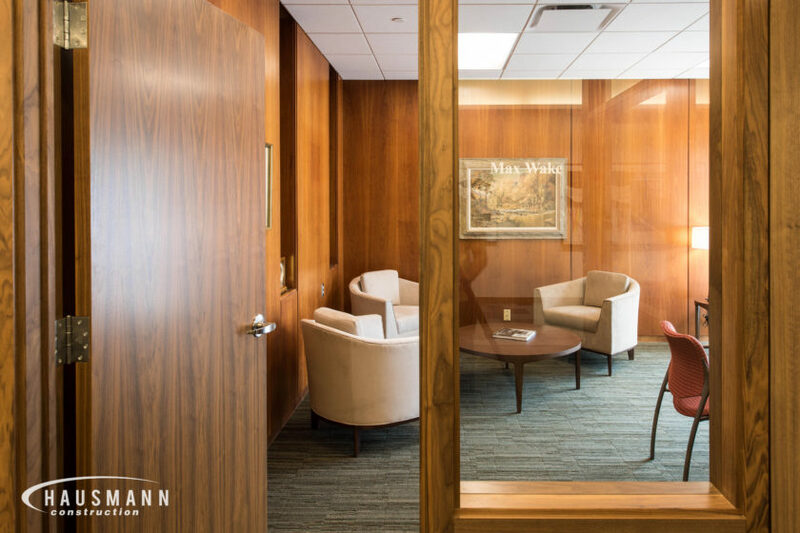 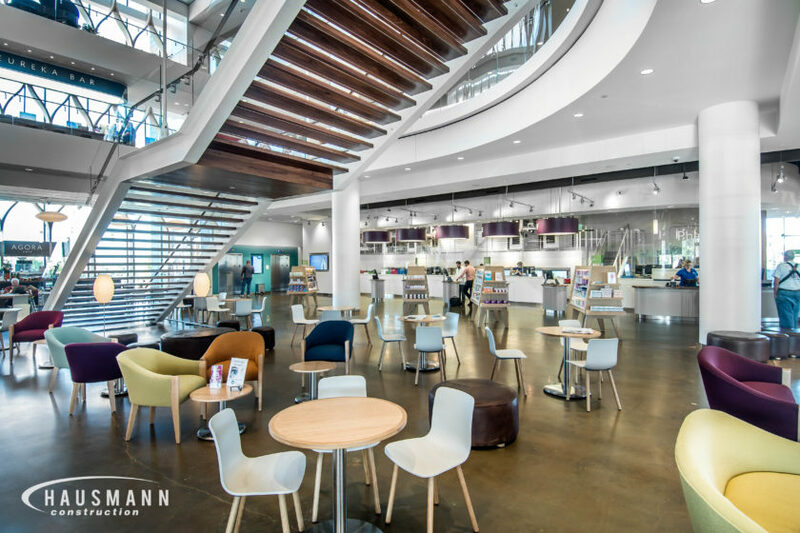 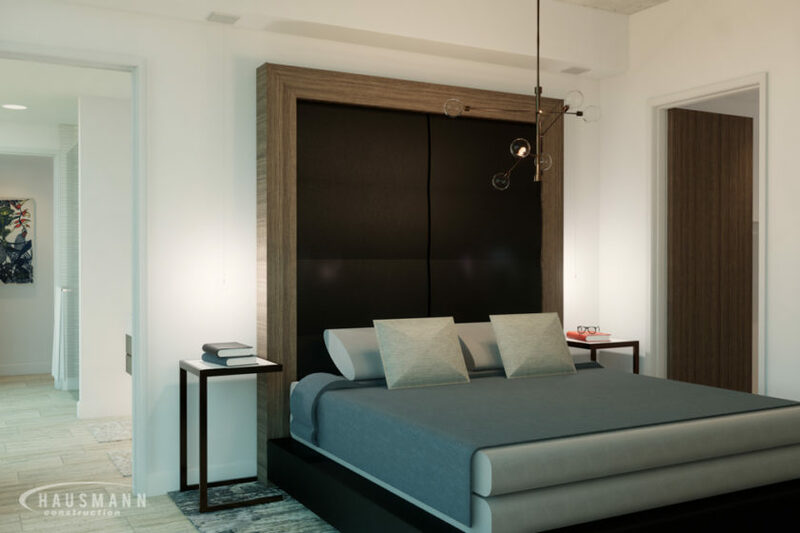 With a fast-paced, three month timeline, Hausmann worked through numerous designs and found the best solutions to promptly achieve owner vision and brand goals. 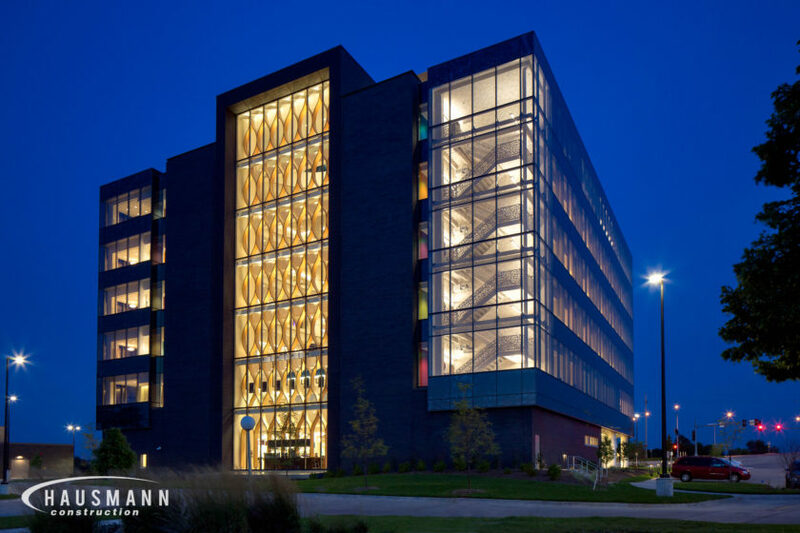 Hausmann worked closely with the architect and design consultants picking first-rate materials and managing the unique design features. 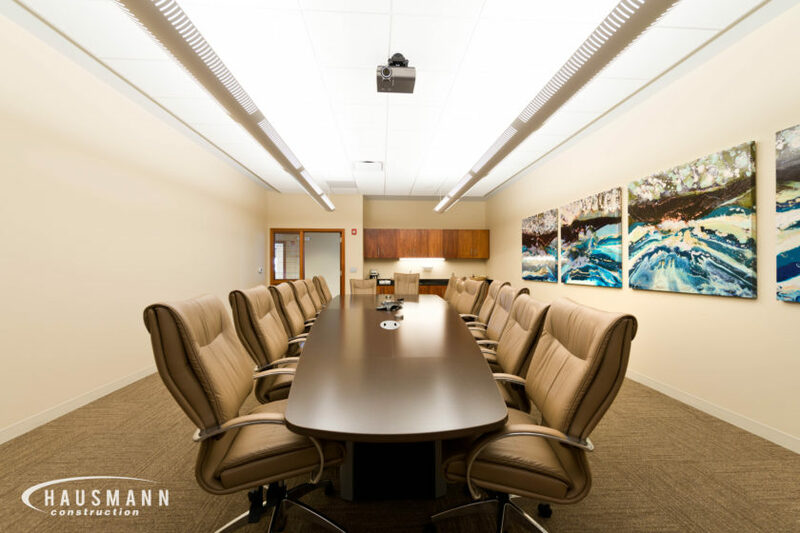 The space is truly extraordinary and features a conex box in the center of the office, fit with conference rooms and larger offices inside. 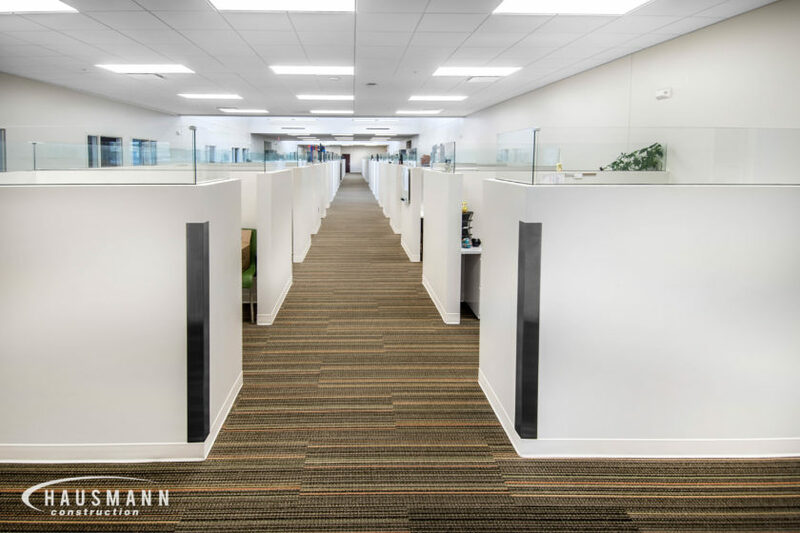 Surrounding the conex box are desks to fit an ever expanding team. 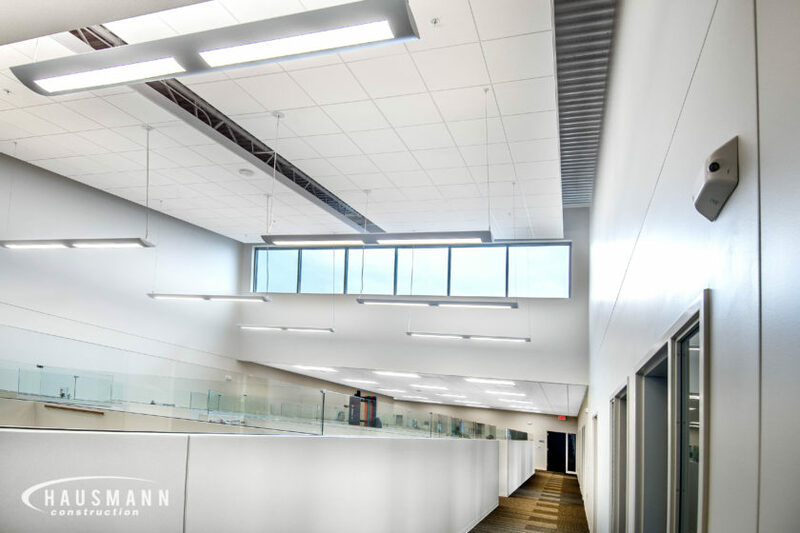 Other features include open ceilings that expose structural beams and high windows that bring in natural light. 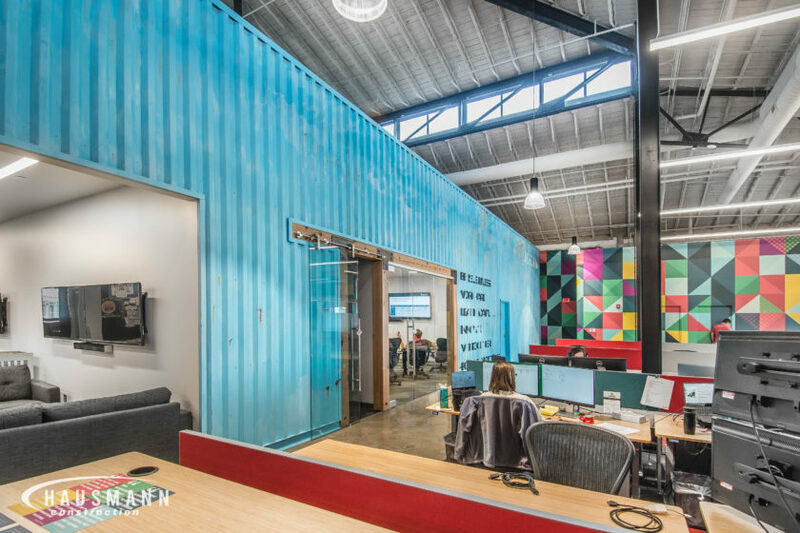 Keeping with the design theme is the reclaimed wood throughout the entire space, interior garage doors and barn doors in the break room. 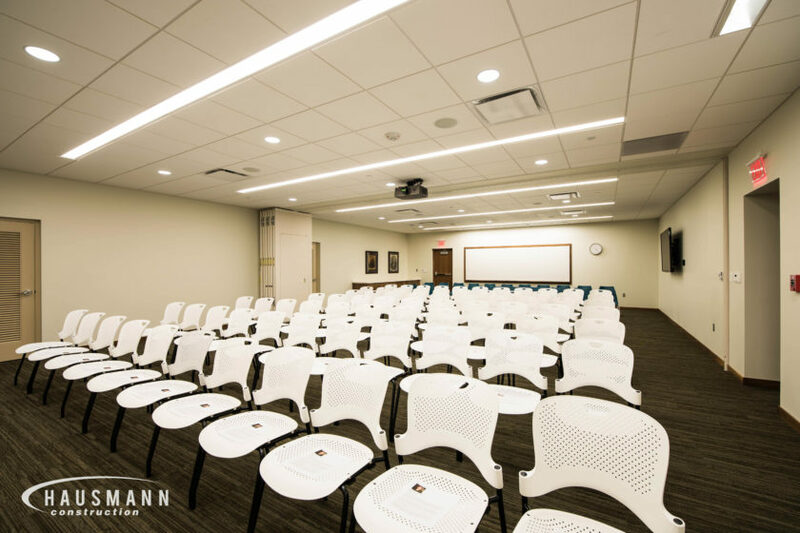 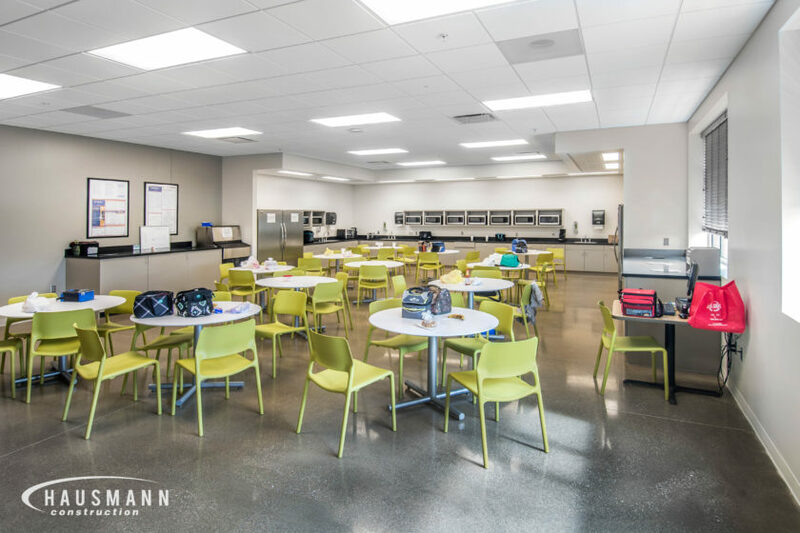 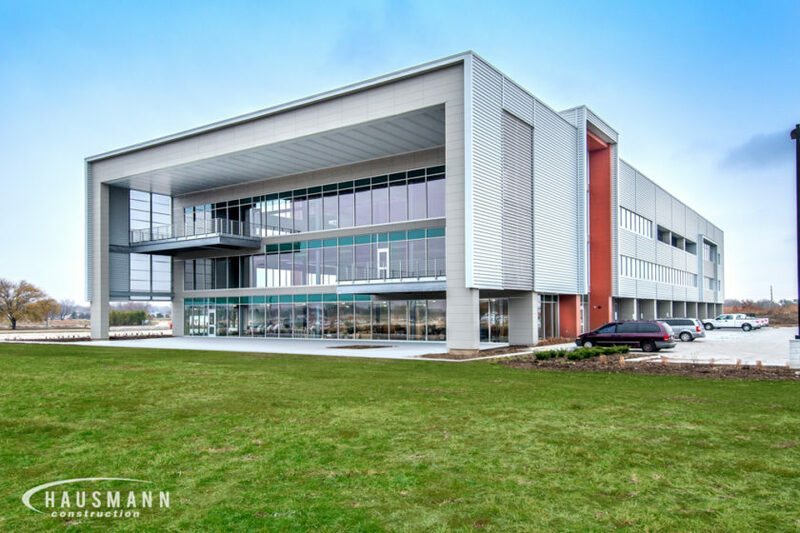 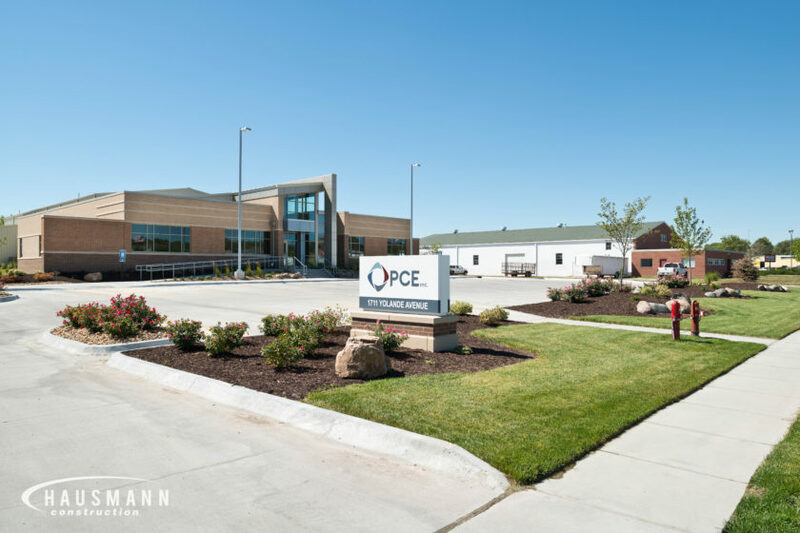 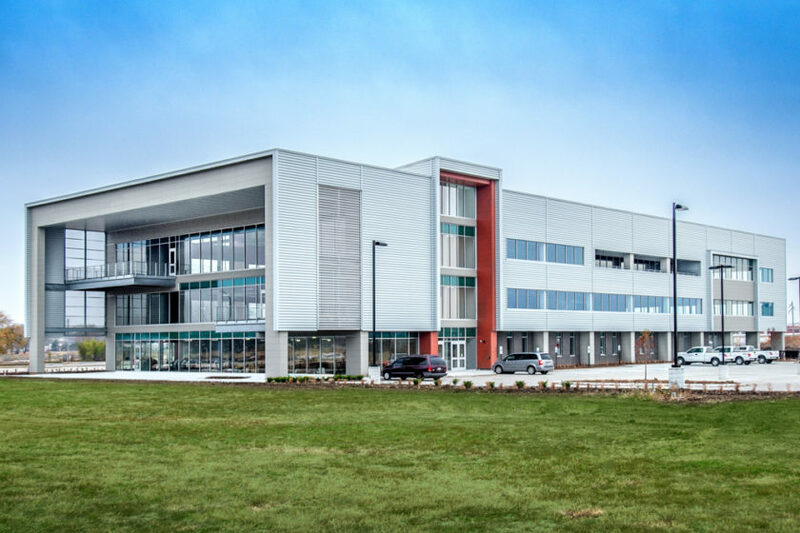 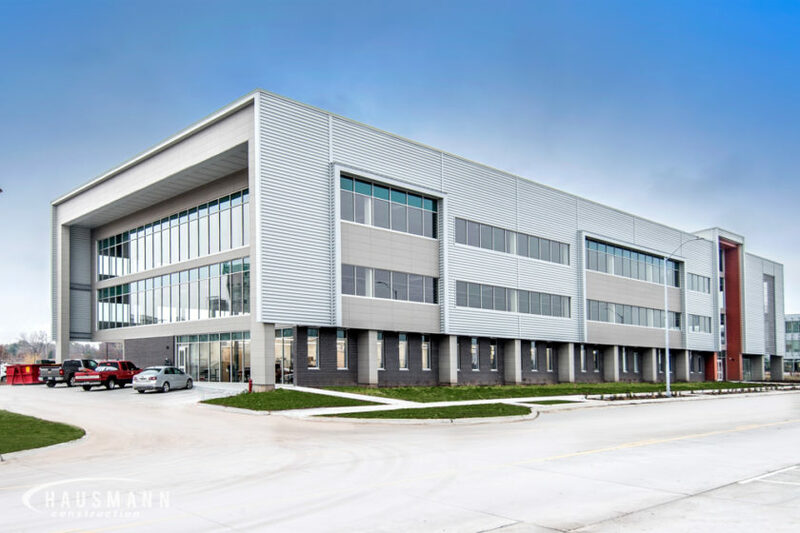 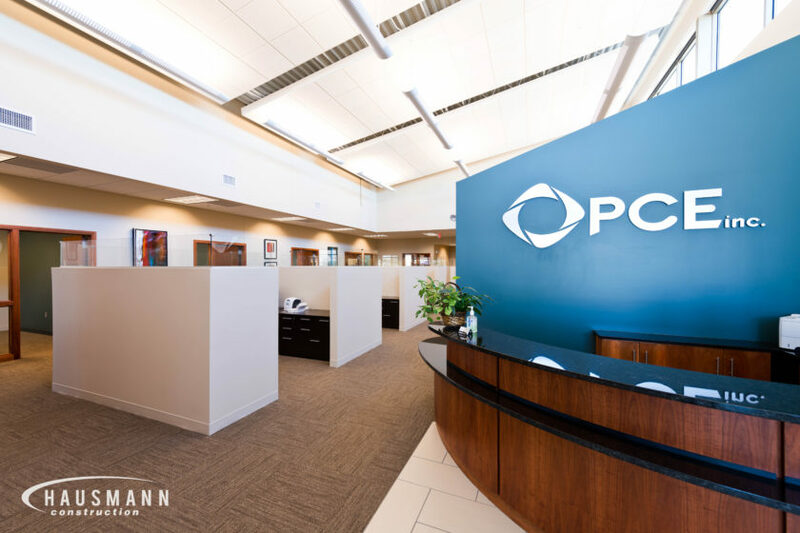 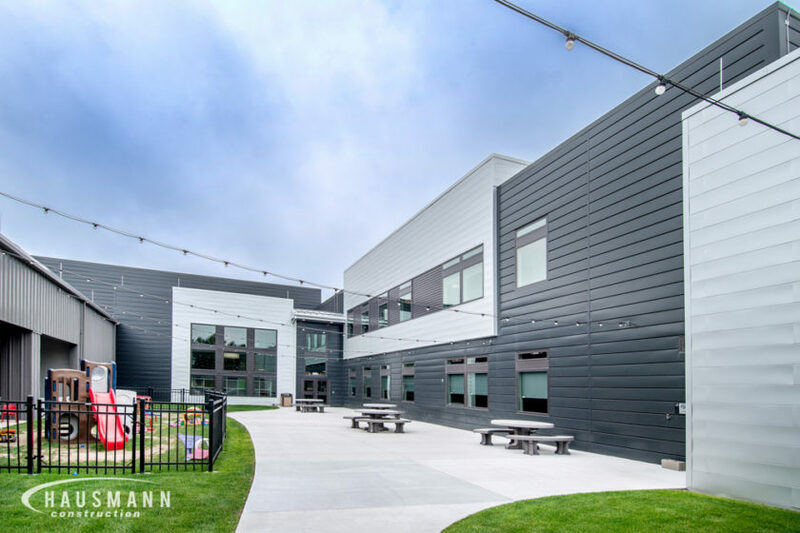 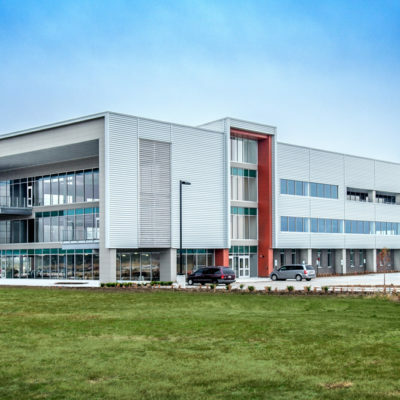 Hausmann Construction was selected to complete Phase 1 and Phase 2 of the corporate headquarters buildings for Plastic Companies Enterprises and Geist, which is the largest division of PCE, Inc. 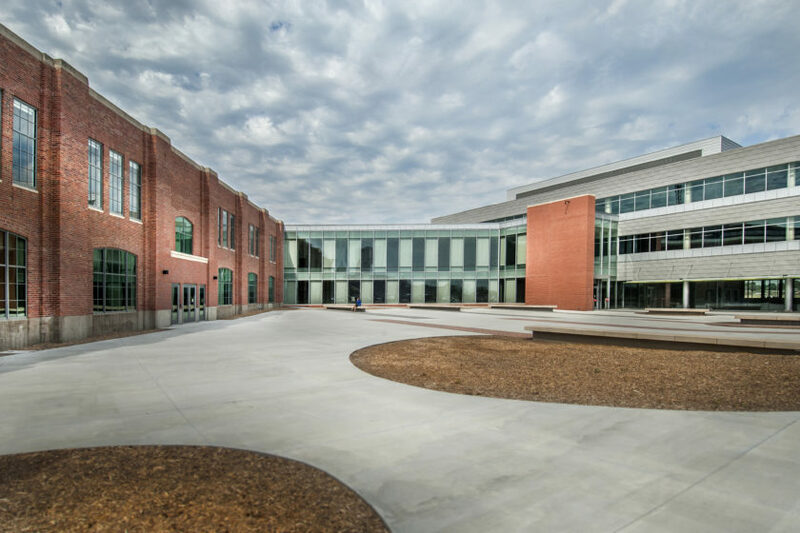 Both phases were similar in design. 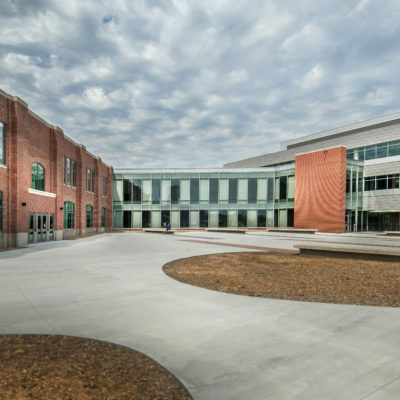 The office portion of the buildings features a brick veneer and a prominent main entrance set off by angular architectural forms. 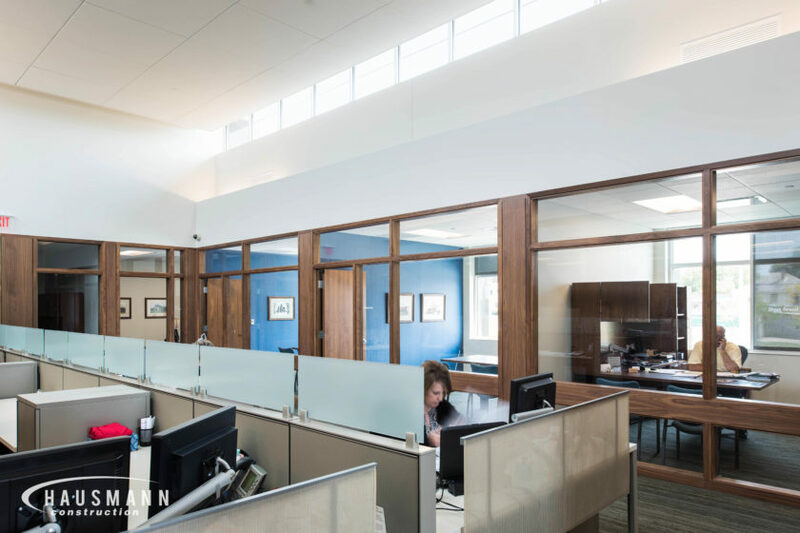 A lobby, reception area and offices surround an open workstation area and central conference room. 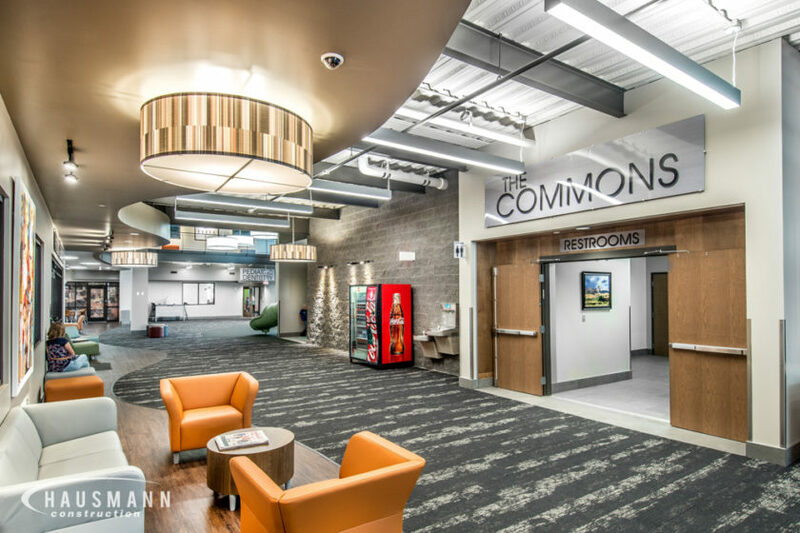 The office section of the building also features a workout/fitness facility, a shower area and break rooms. 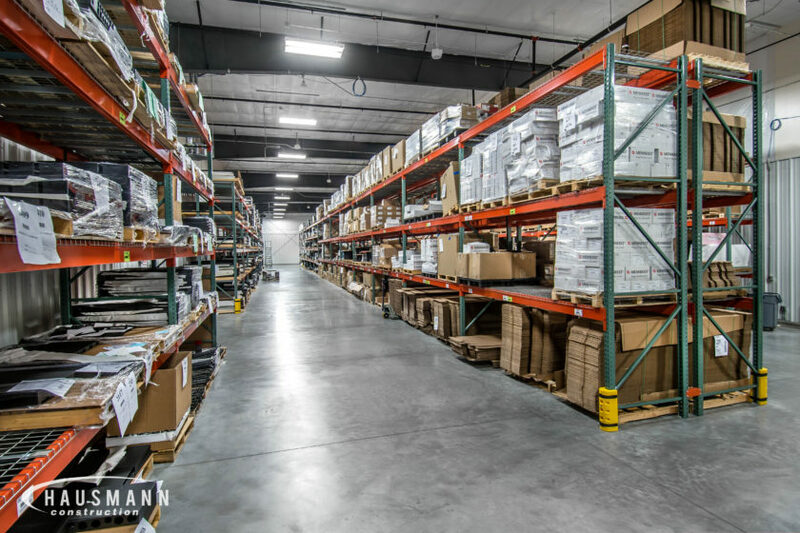 The warehouse portions of the facilities, located at the back of each building, are pre-engineered metal structures. 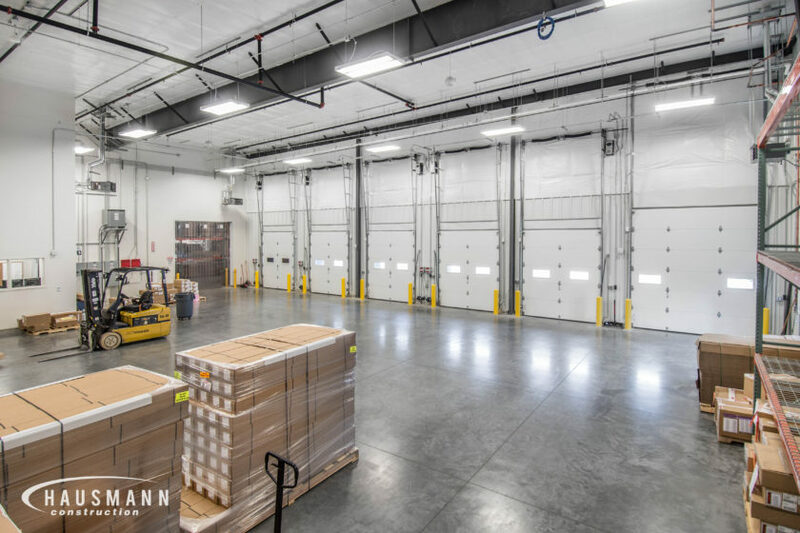 They feature a large open area that can be used for storage, maintenance and shipping/receiving to meet immediate needs and also house manufacturing operations. 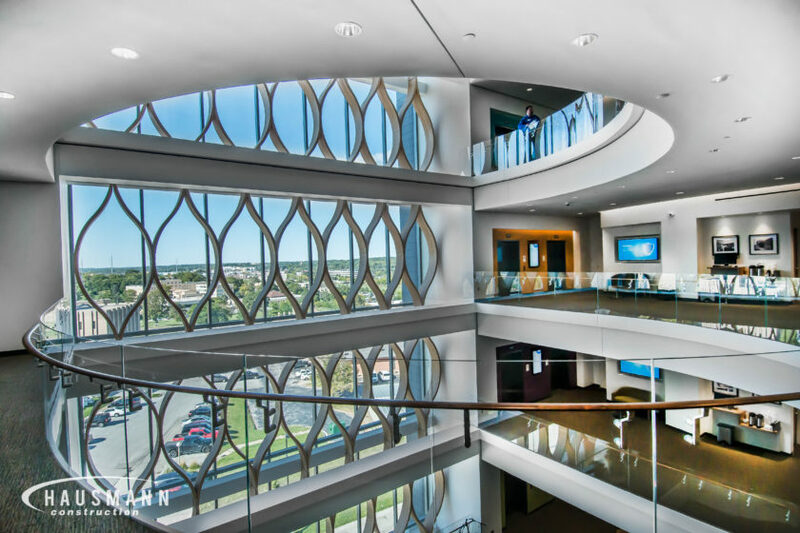 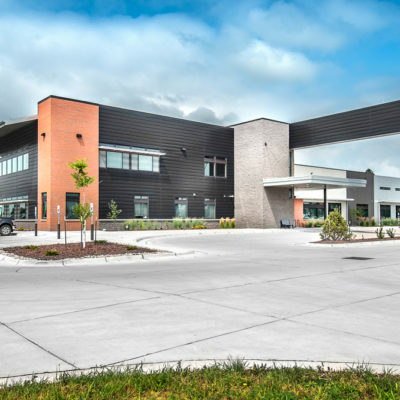 The Think Whole Person Healthcare Facility is 150,000 square feet of new construction designed to handle over 800 patients per day, along with a staff of over 500. 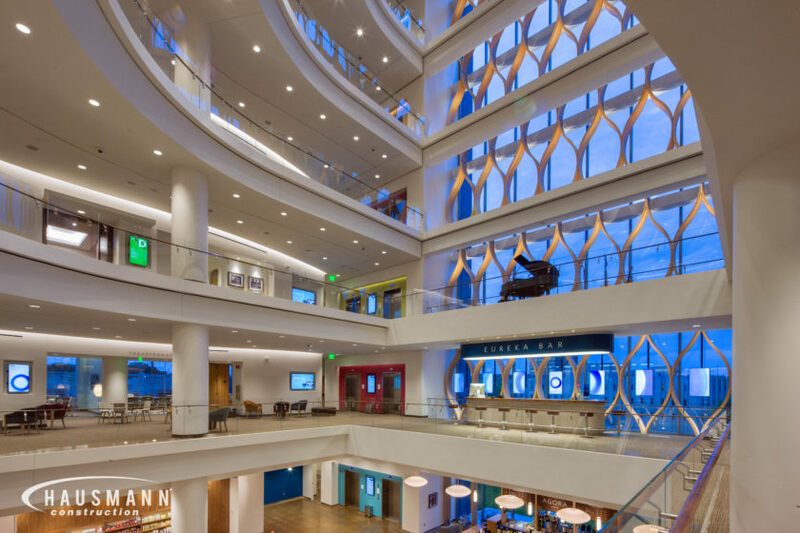 The design features an open atrium and retail space on the ground floor which is home to a fully robotic pharmacy and gathering rotunda with a full-service coffee bar. 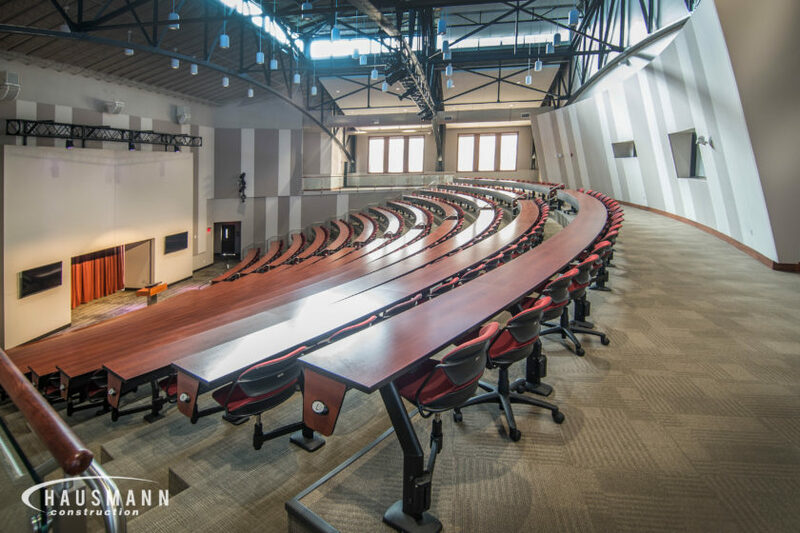 There is a teaching auditorium, teaching kitchen and open classrooms on the second floor used for local events, symposiums and seminars all related to healthy living. 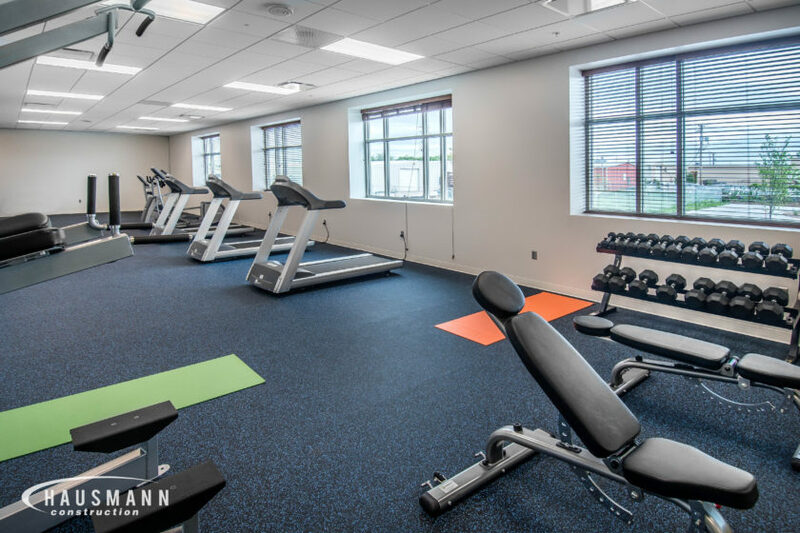 The second floor features a workout/physical therapy gymnasium and medical spa for patients. 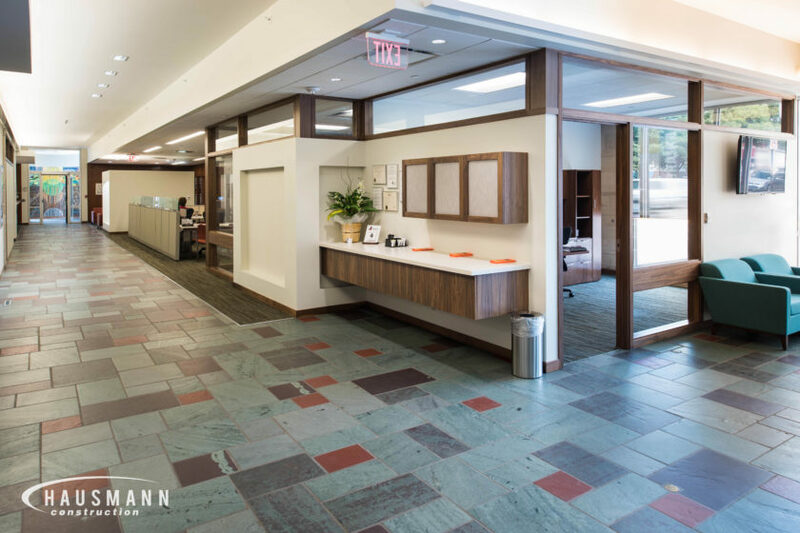 Levels 3 thru 5 are state of the art practice rooms for physicians, clinicians, pharmacists, dentists, optometrists and specialists, allowing this to be a one-stop shop for healthcare. 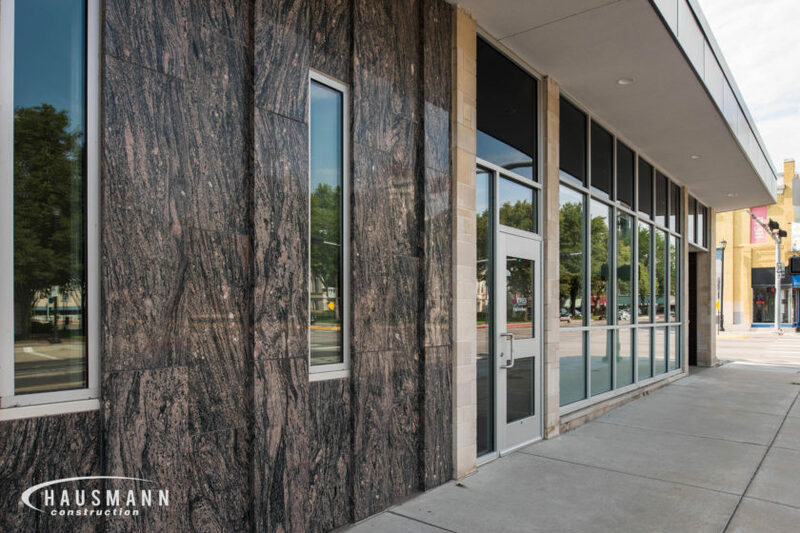 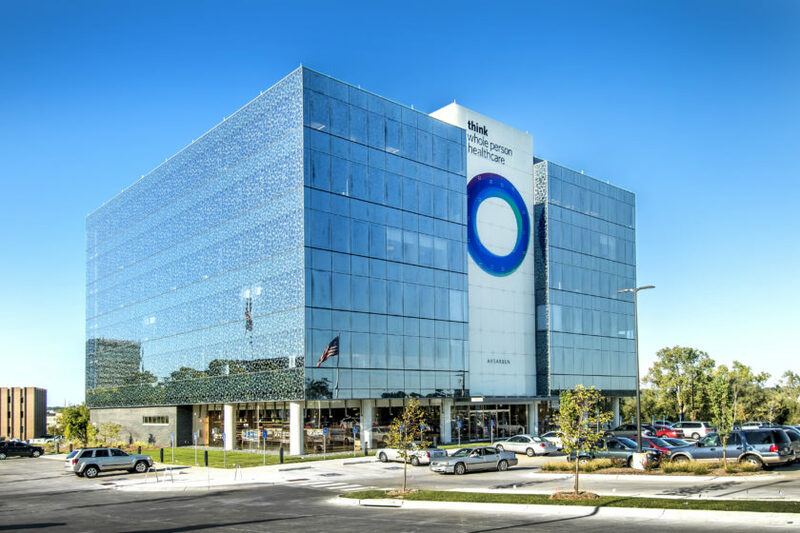 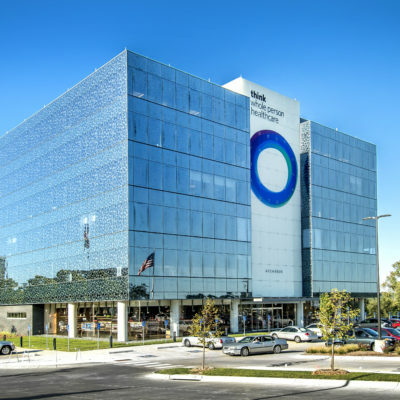 A signature landmark of the Aksarben area, this building not only stands out with awe-inspiring architecture and finishes but also for its integrated exterior signage and façade. 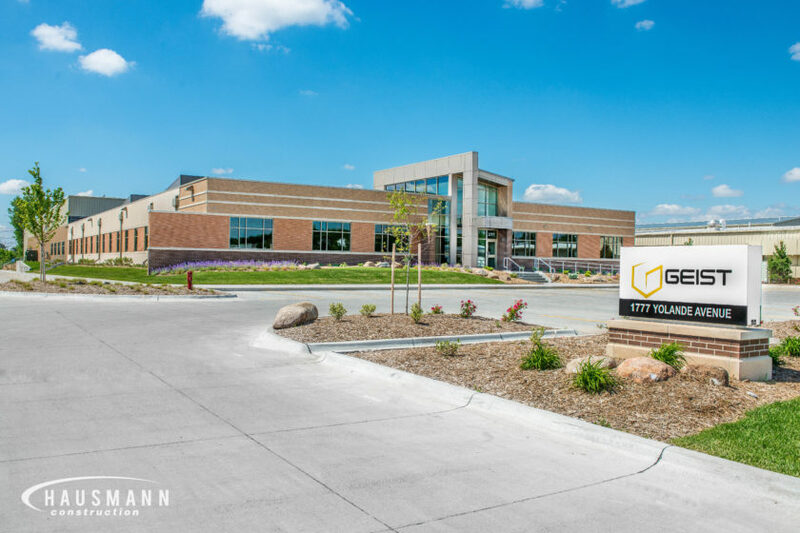 The Elite Health Center is a two-story, 75,000 square foot health and wellness facility with fourteen tenant suites, indoor kids’ play area, community room and other amenities located in Scottsbluff, Nebraska. 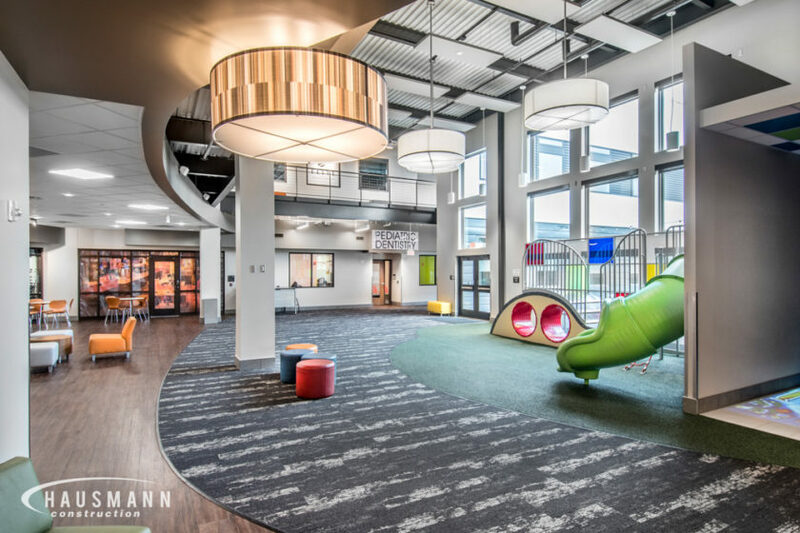 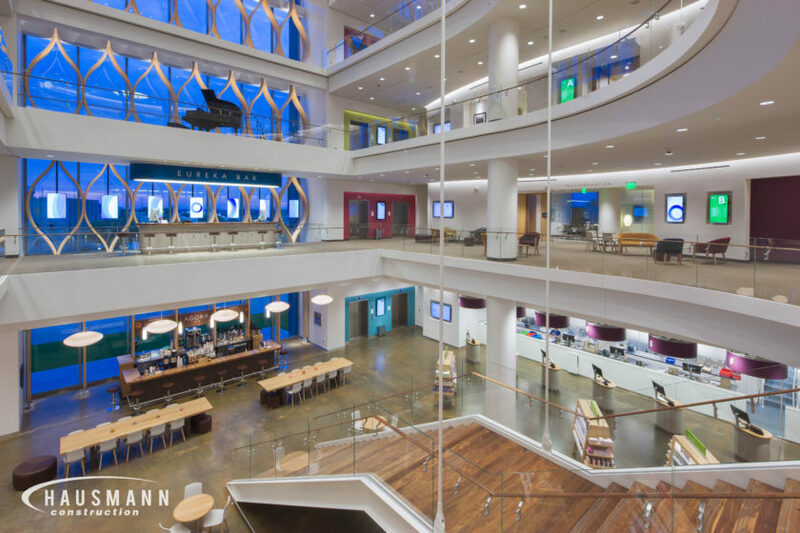 The kids’ indoor play area is in the center atrium of the building, which has comfortable seating, access to the coffee shop offering healthy-eating choices, technology stations and access to an outdoor courtyard area. 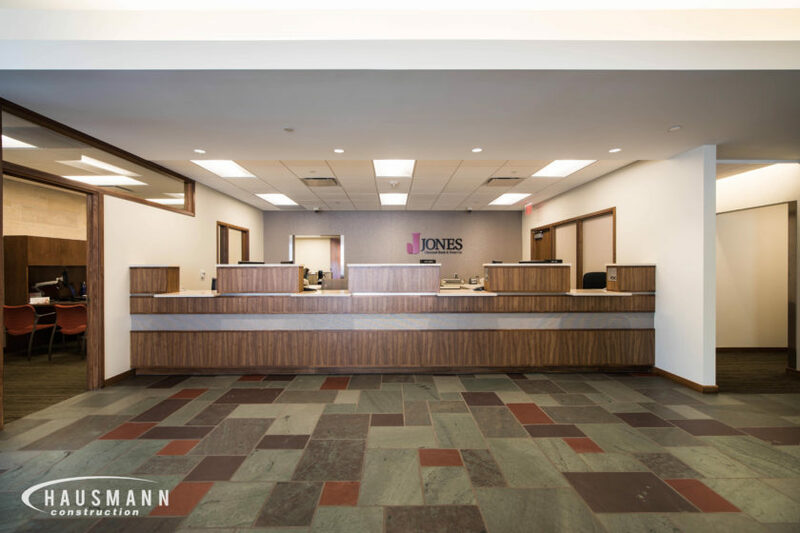 The Jones National Bank project consisted of demolition of the old building and construction of the new facility in Seward, Nebraska. 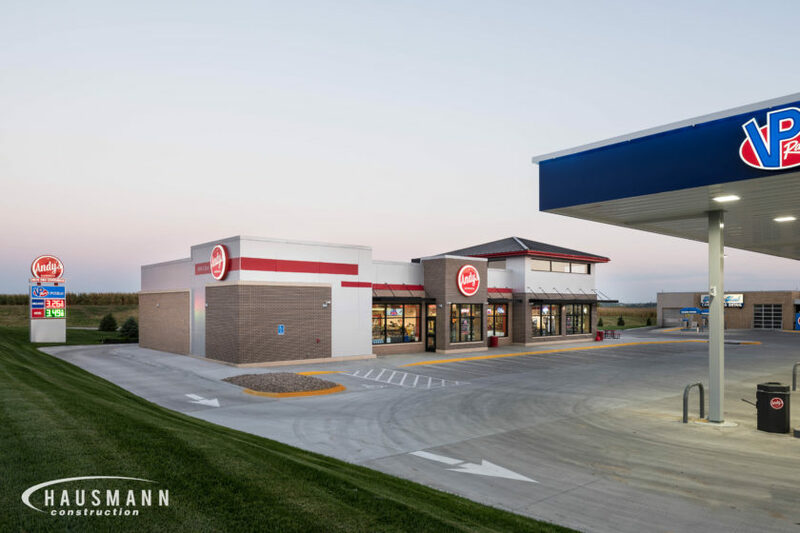 Hausmann also completed the site work and adjacent parking lots. 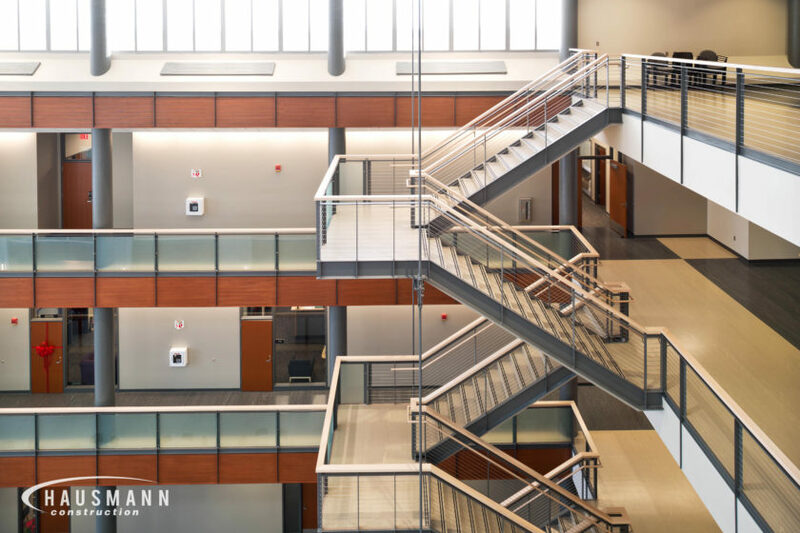 Included in the new building are offices, cubicles, drive up window, vault and commons area. 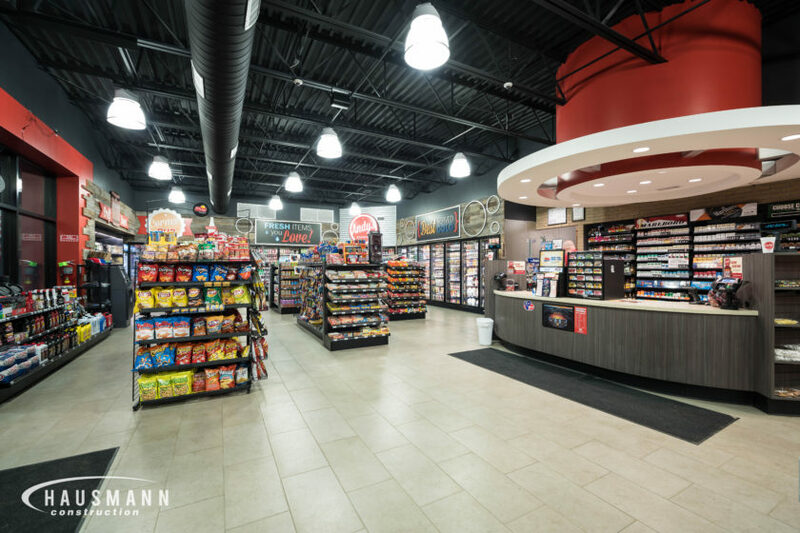 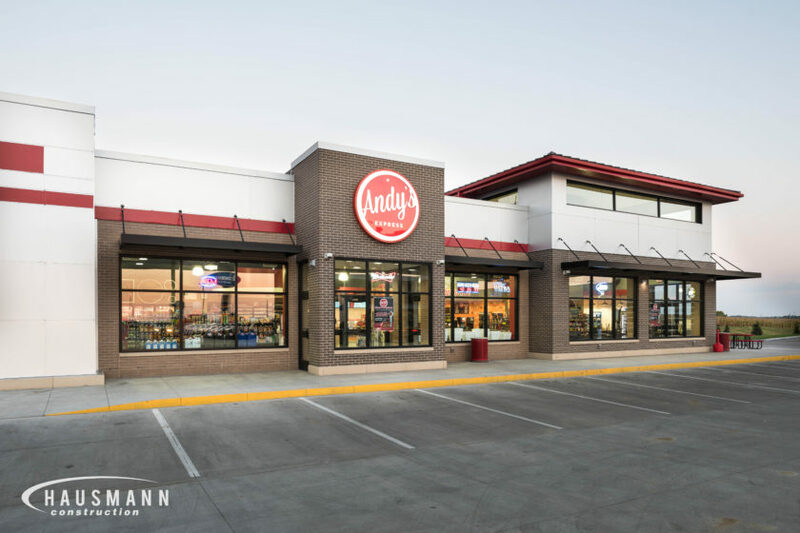 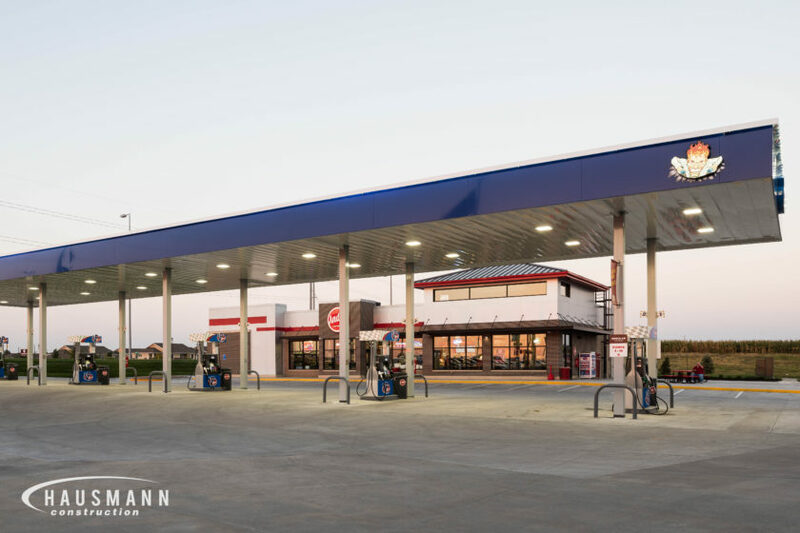 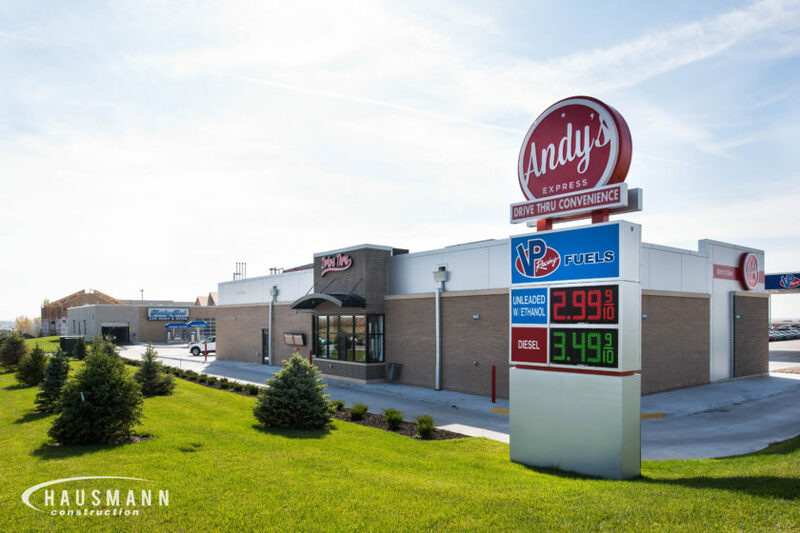 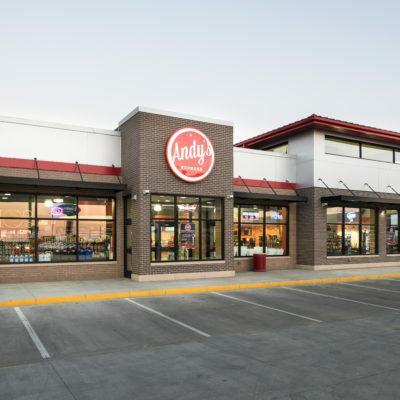 Andy’s Express is a convenience store and gas station located in Southwest Lincoln, Nebraska. 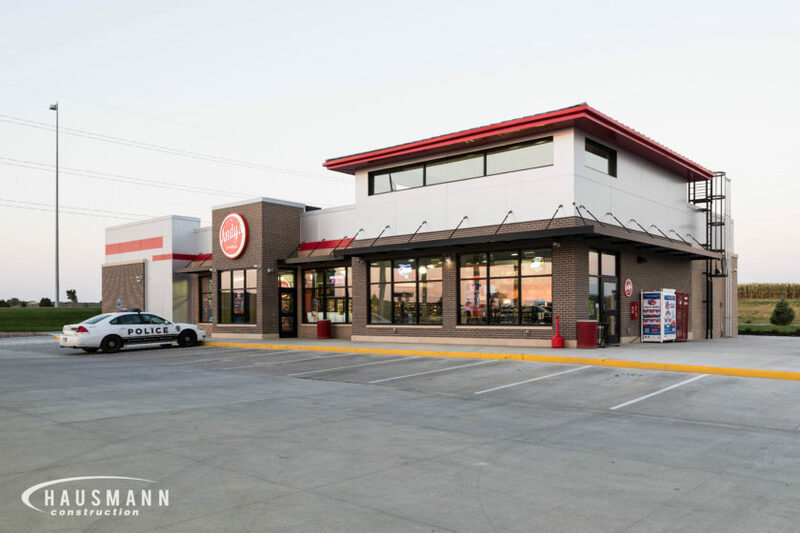 The main feature is the drive-thru window that allows you to get anything you need without ever having to get out of your vehicle. 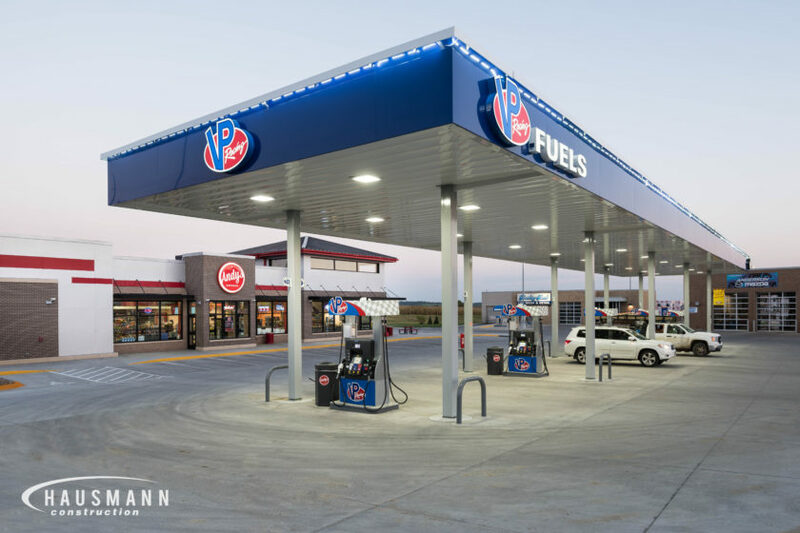 There are five gas pumps that allow 10 vehicles to get gas at one time. 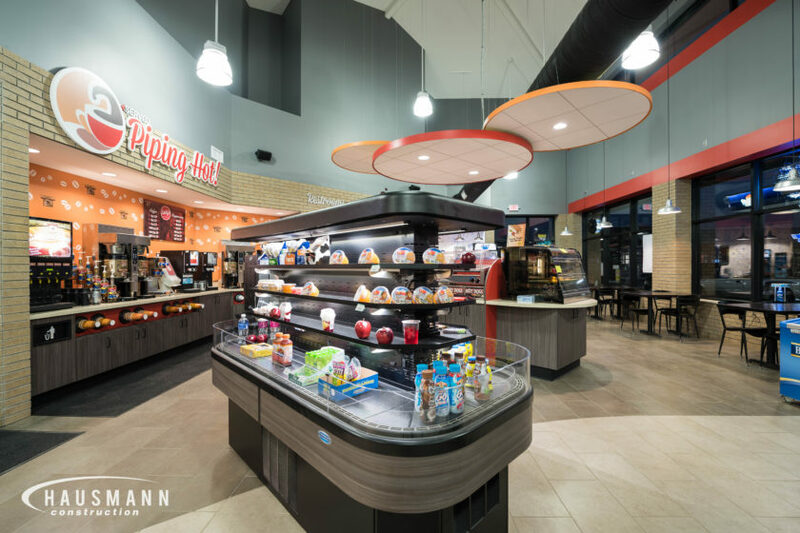 Featured inside the building is a kitchen, large checkout area and plenty of space to maneuver through the aisles. 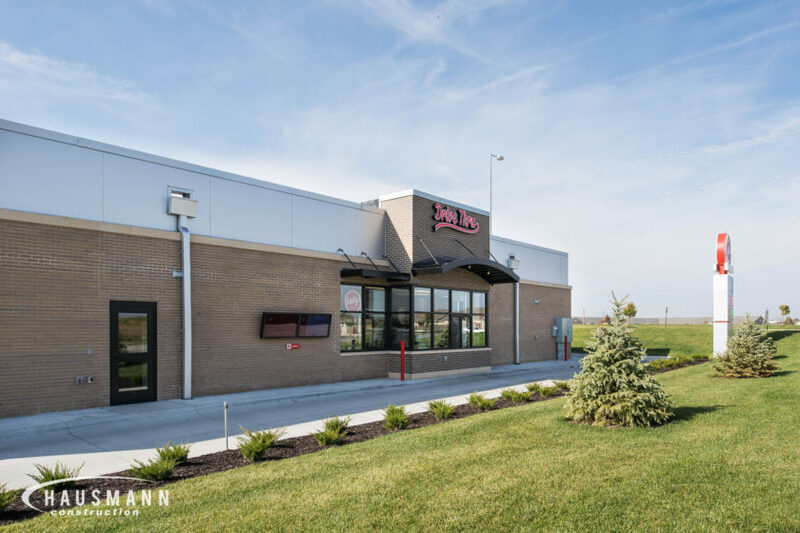 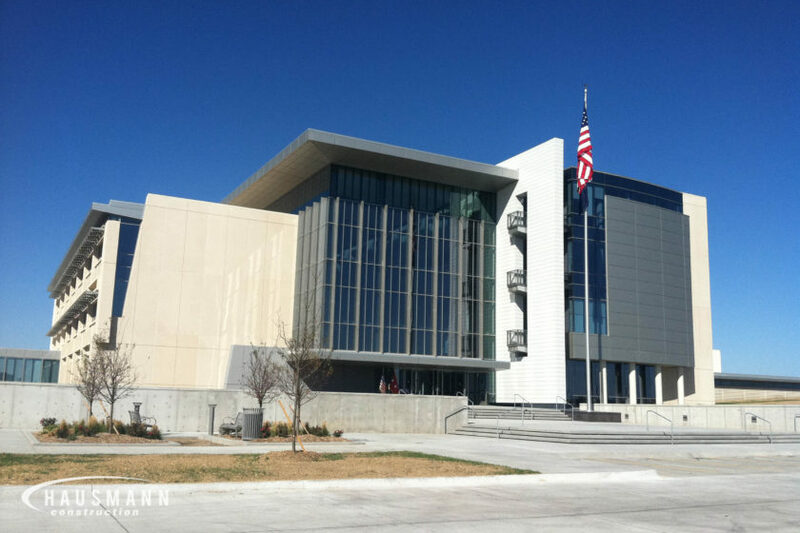 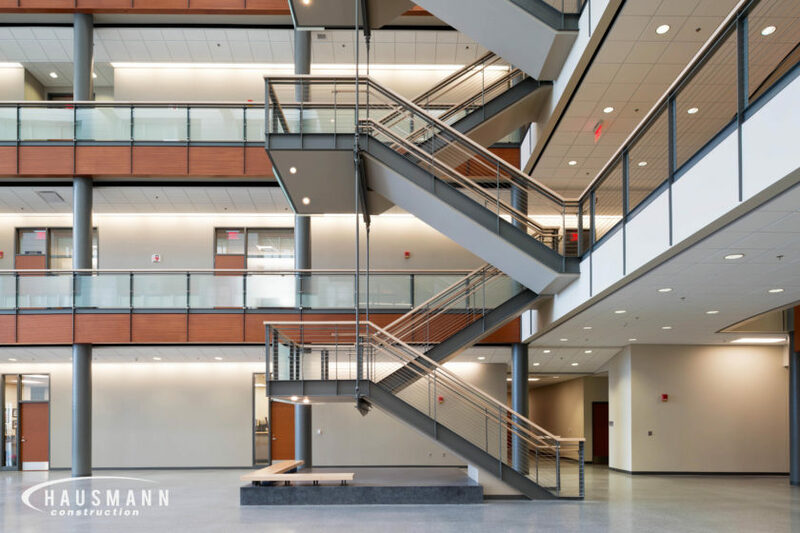 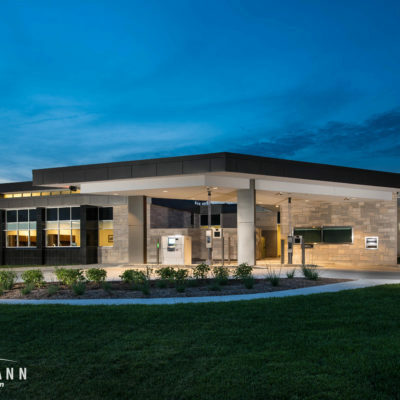 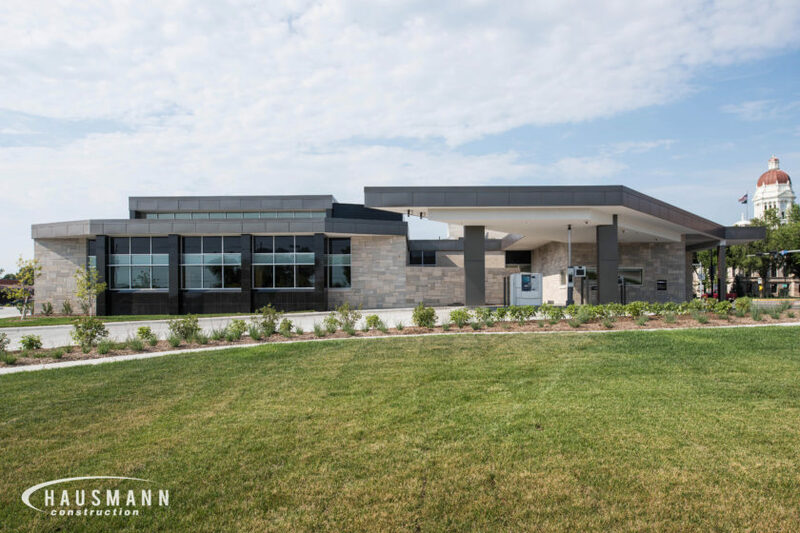 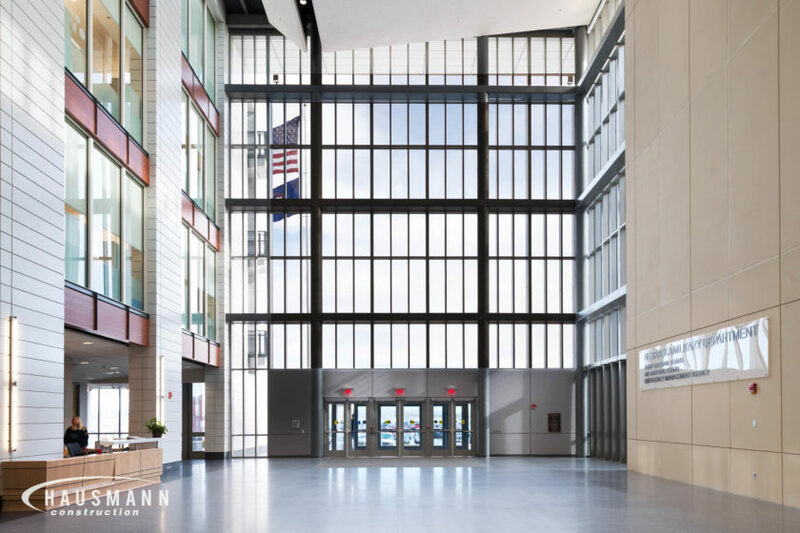 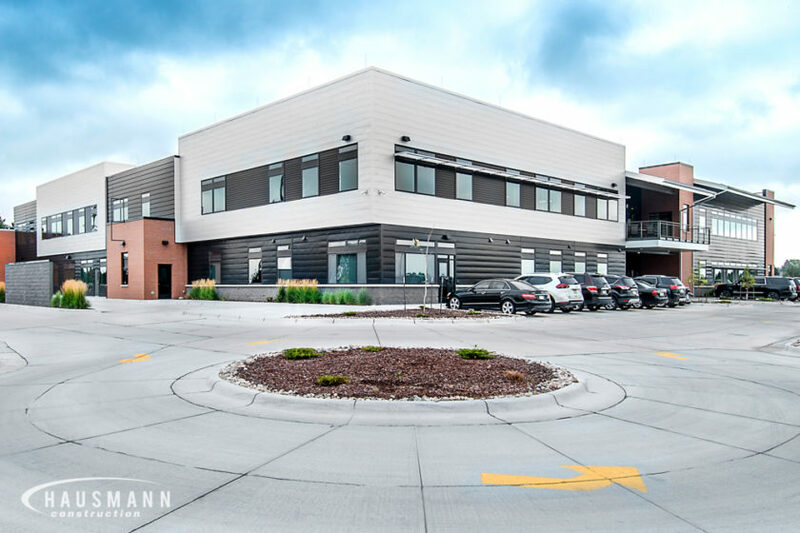 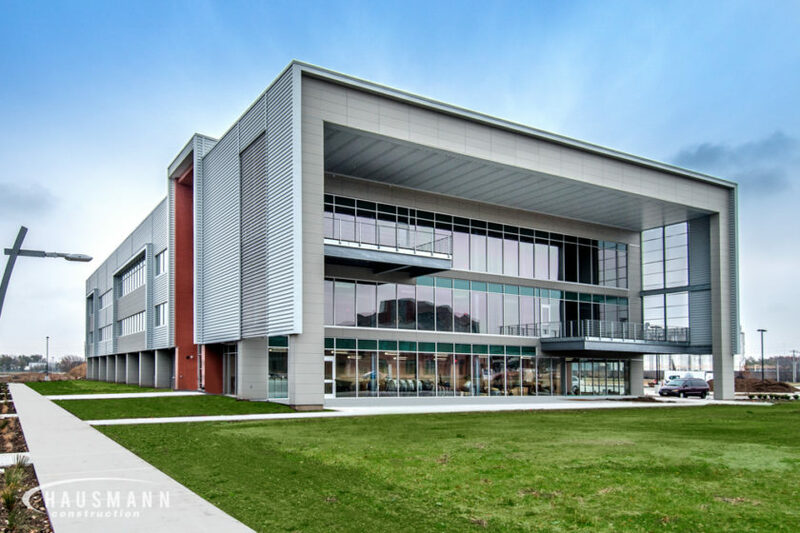 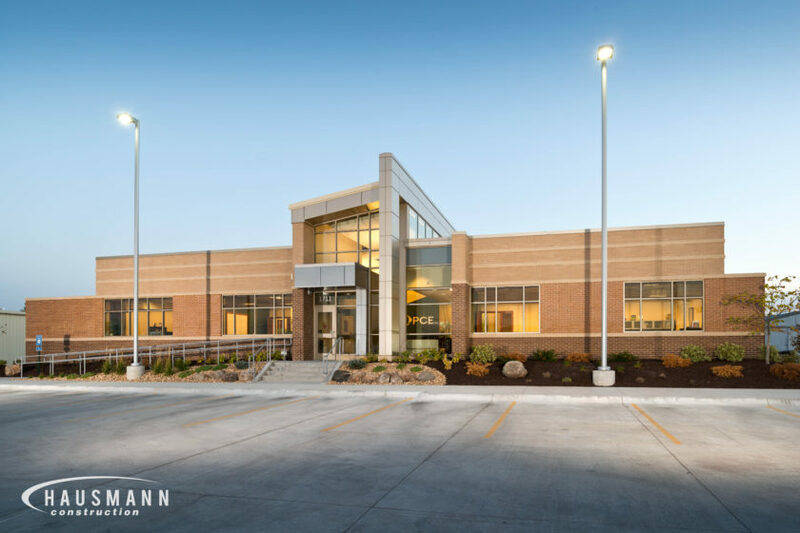 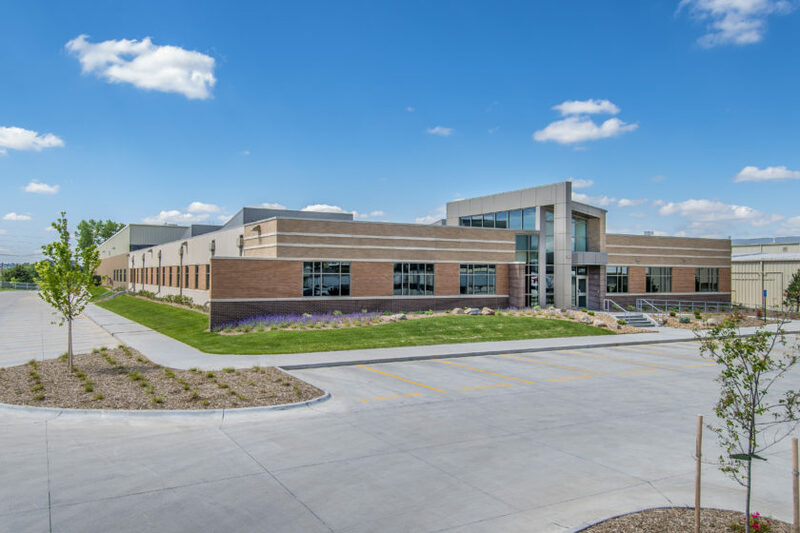 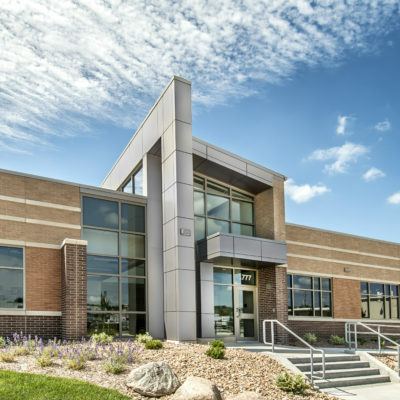 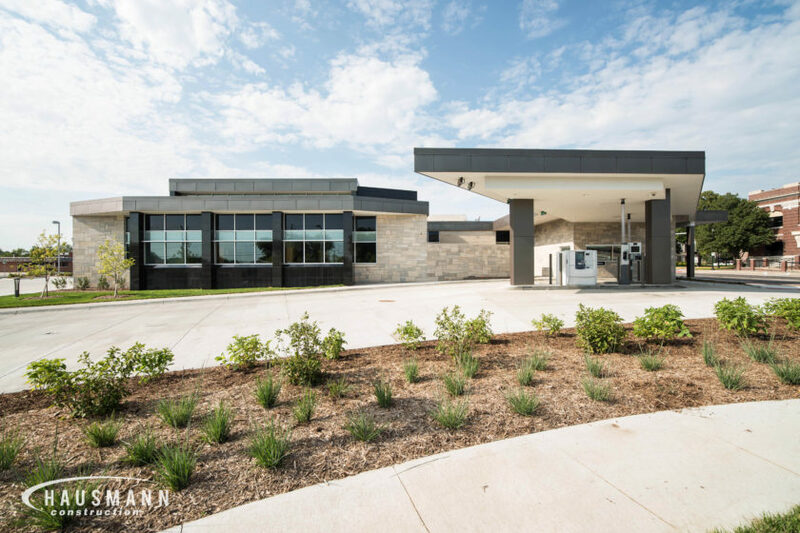 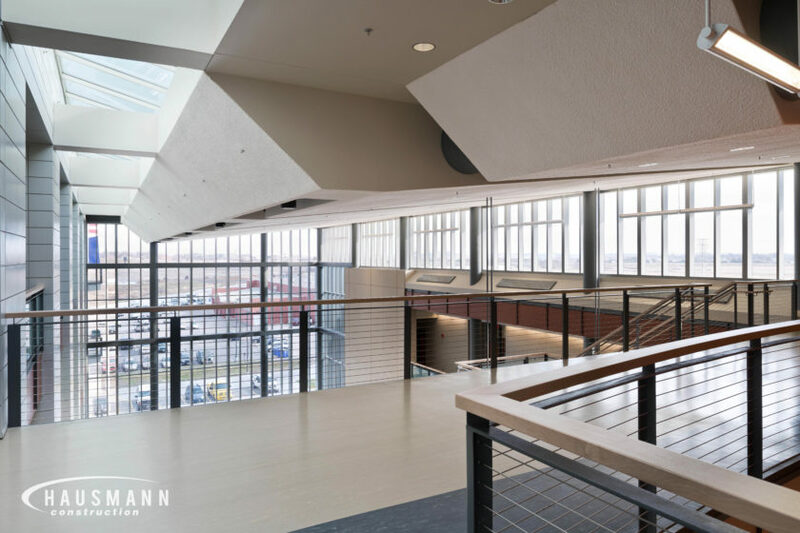 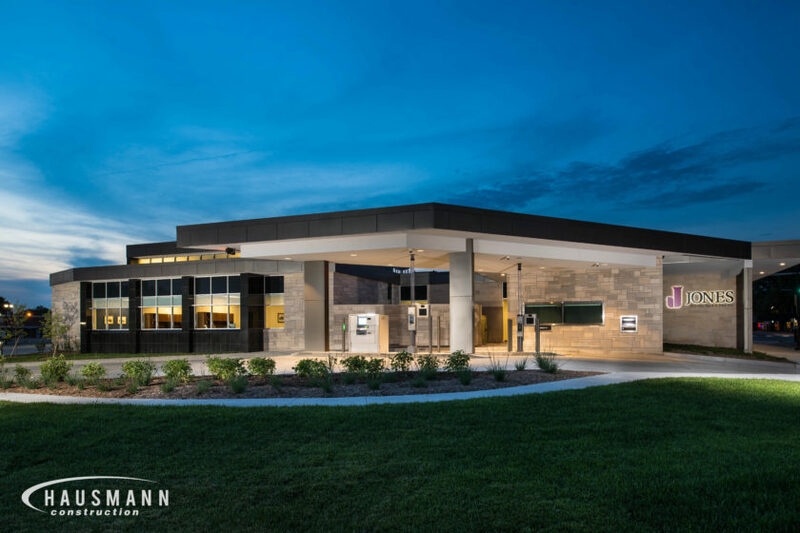 Hausmann completed a highly acclaimed 140,000 square foot office building to serve as the strategic headquarters for the Nebraska Army and Air National Guard units. 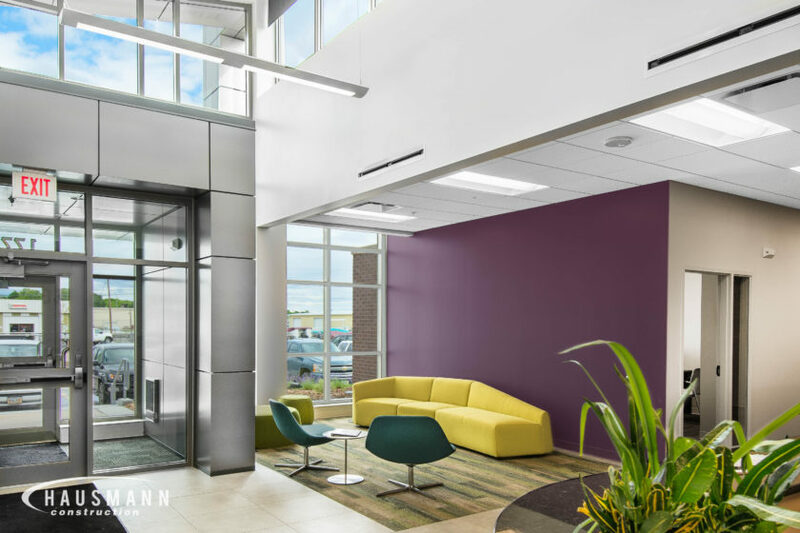 The high-performance building qualifies for LEED Silver status and includes innovative daylighting features that enhance office working morale and achieve energy efficiency goals. 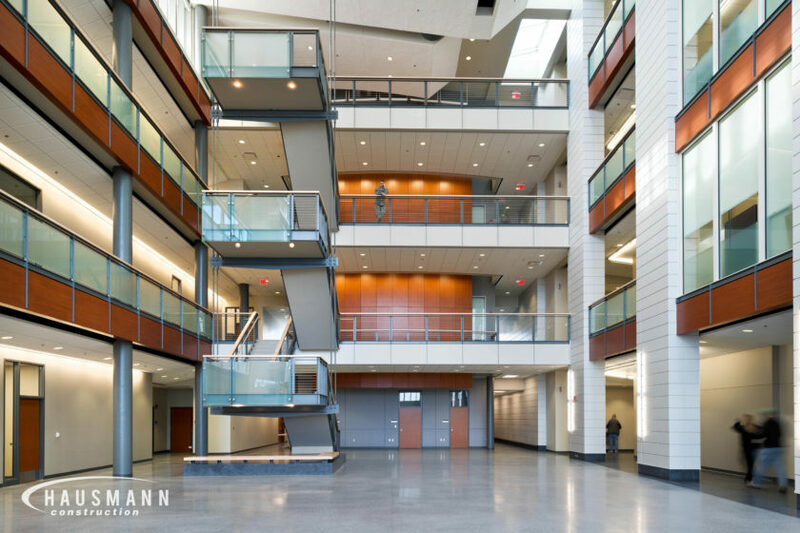 The building is organized around a large multi-story assembly atrium with offices adjoining the north and south sides of the atrium. 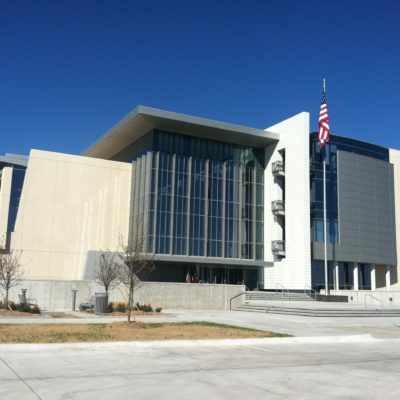 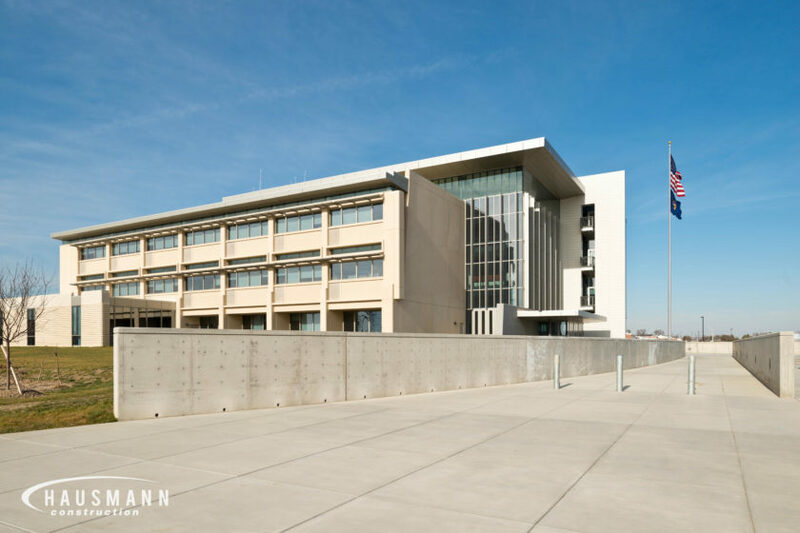 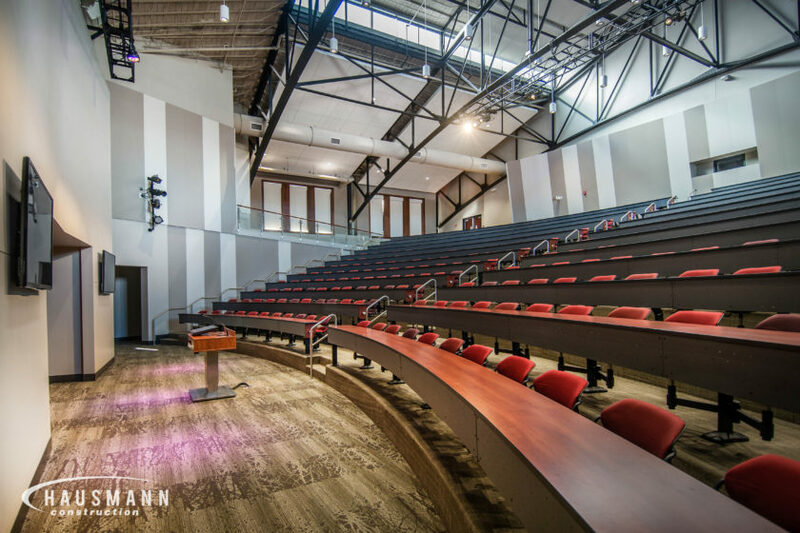 Long-term construction materials were used in the building including colored pre-cast concrete, cast-in-place concrete, exterior metal panels and interior wood acoustical panel systems. 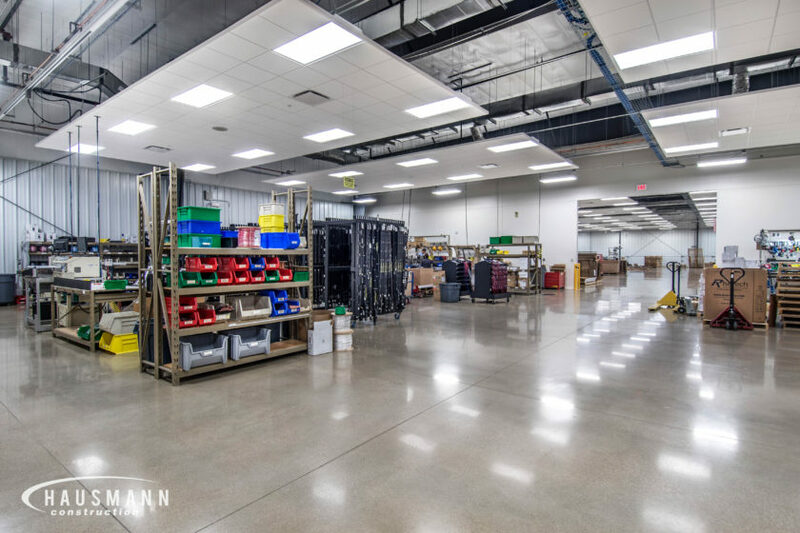 Other features of this building include an extensive access control/security system, sophisticated data room and loading dock area with interior garages. 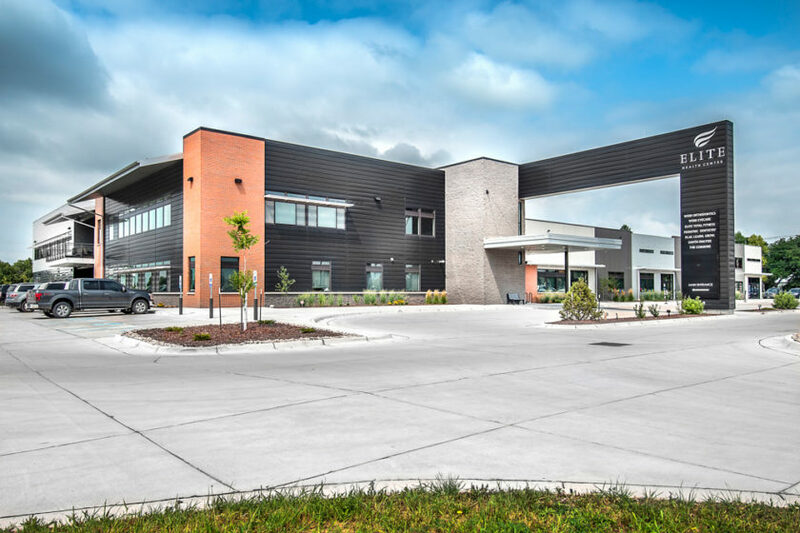 Outside supporting facilities include military and privately-owned vehicle parking, access roads, sidewalks, site lighting and natural landscaping berms, retaining walls and bollards.